59101 6C76 Acton yard to Whatley empties. 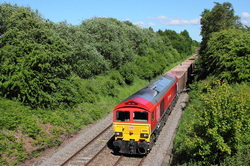 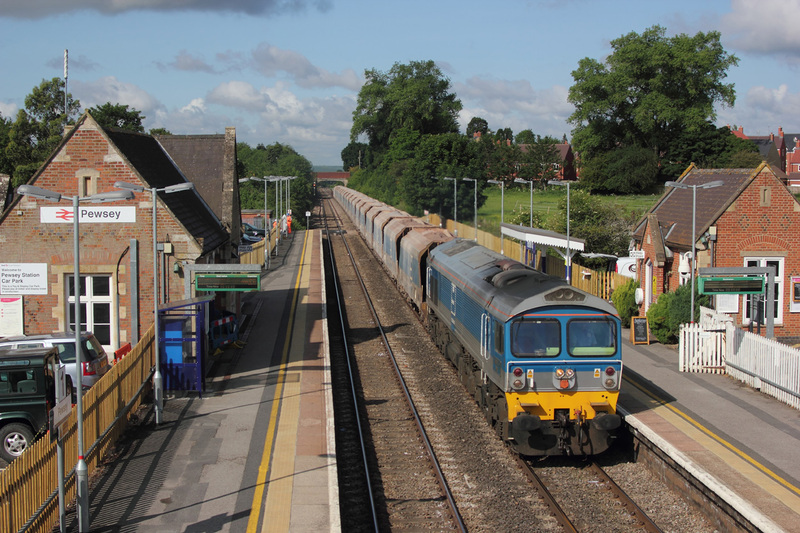 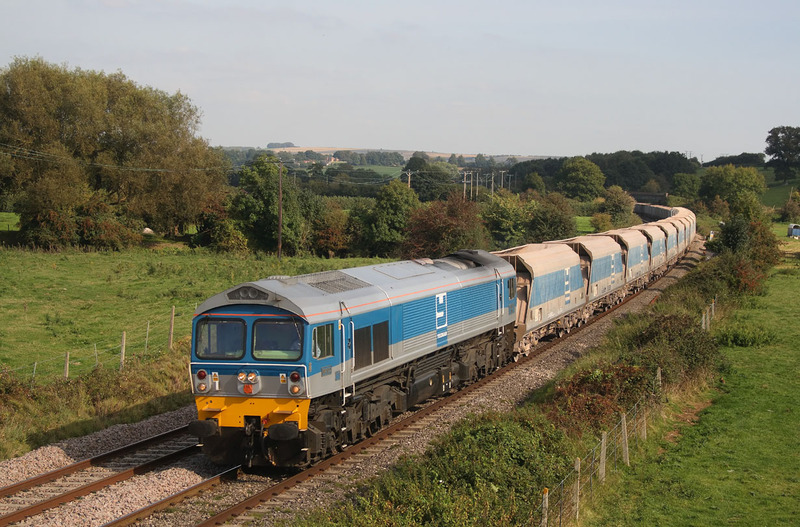 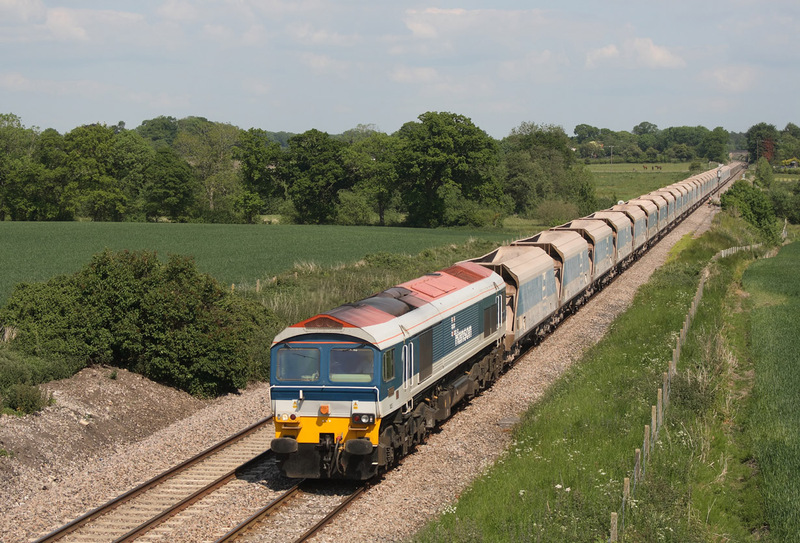 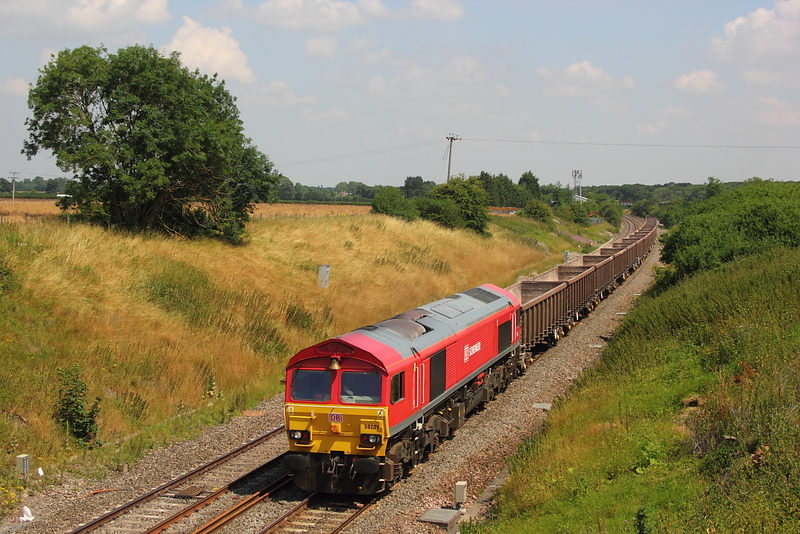 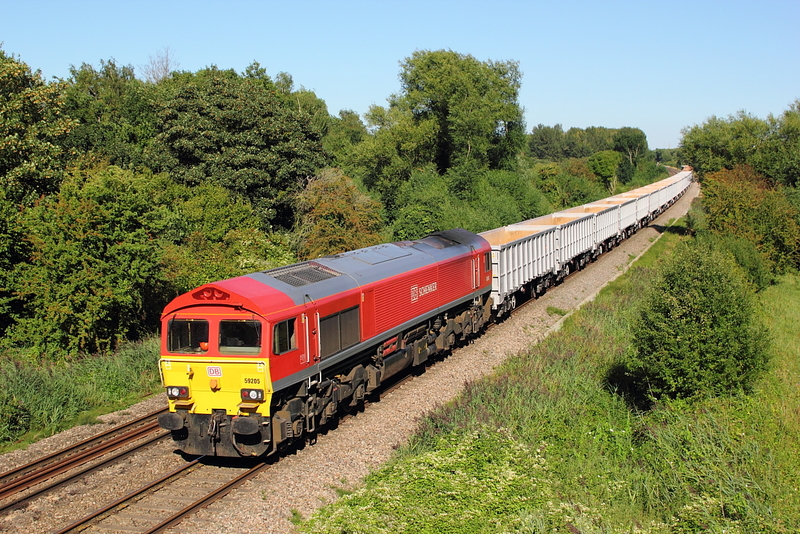 ​ 59206 6V18 Allington to Whatley empties. 59201 on a late running 7C77 Acton to Merehead empties. 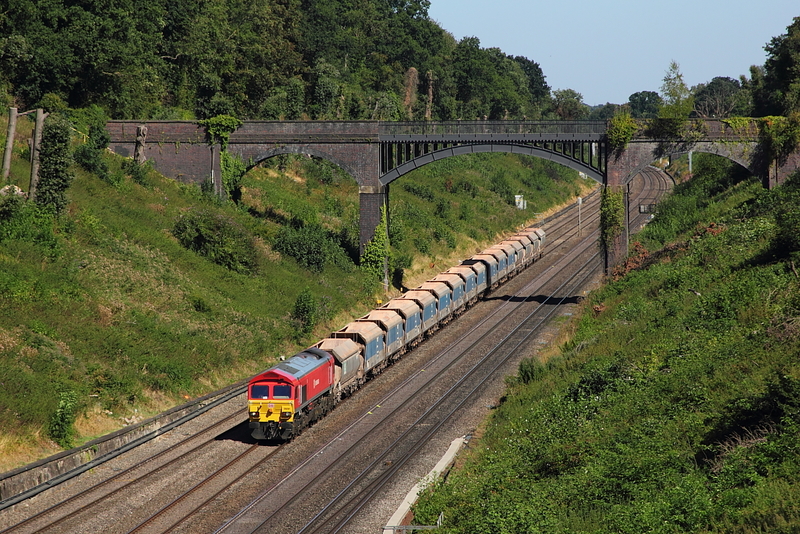 59104"Village of Chantry" finaly pass 102 minutes late with 7A09 Merehead to Acton jumbo after being recessed at Theale due to reported loss of stone on route,and amazingly the exact thing happened the following day. 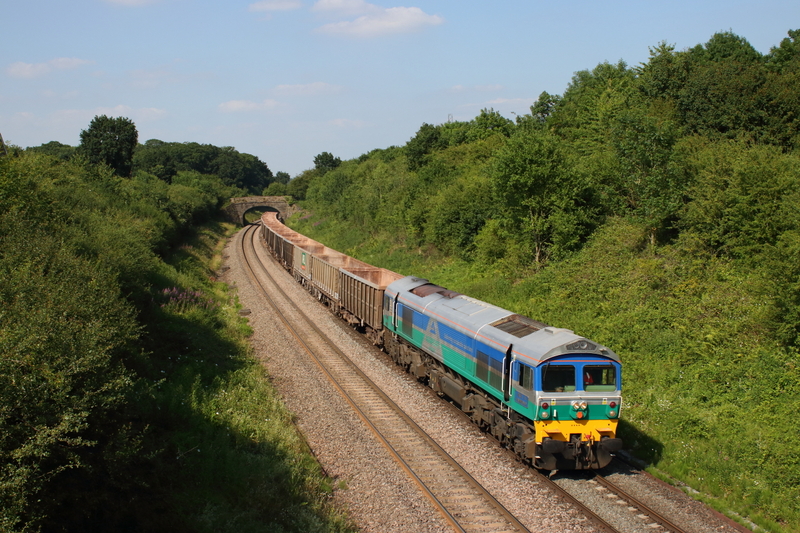 59203 6V18 Allington to Whatley empties. 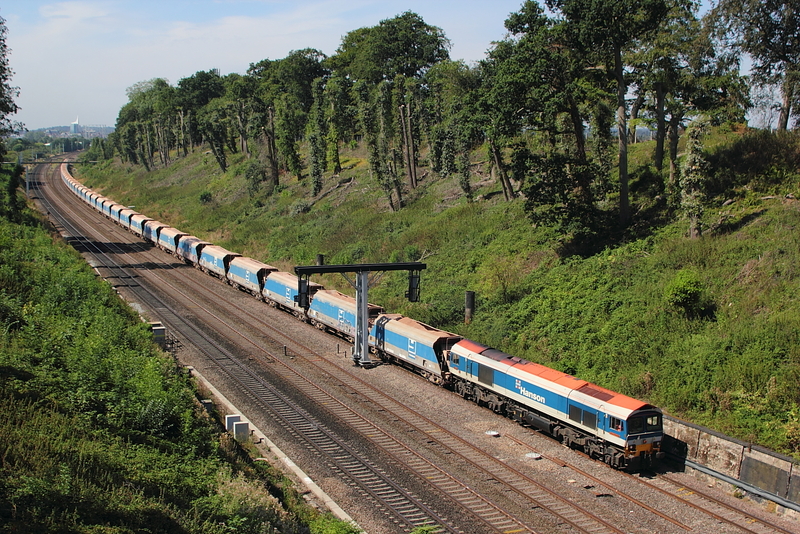 59104"Village of Great Elm" 7C77 Acton to Merehead empties,with the 08.44 Penzance to Paddington passing by. 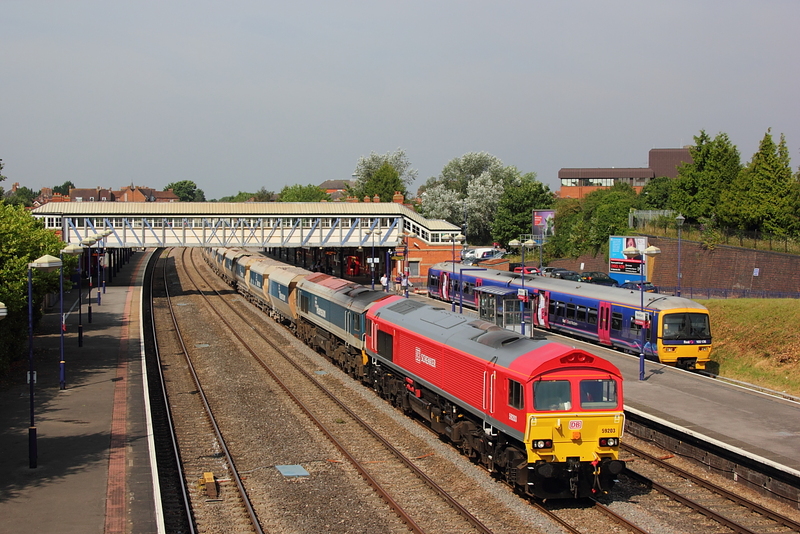 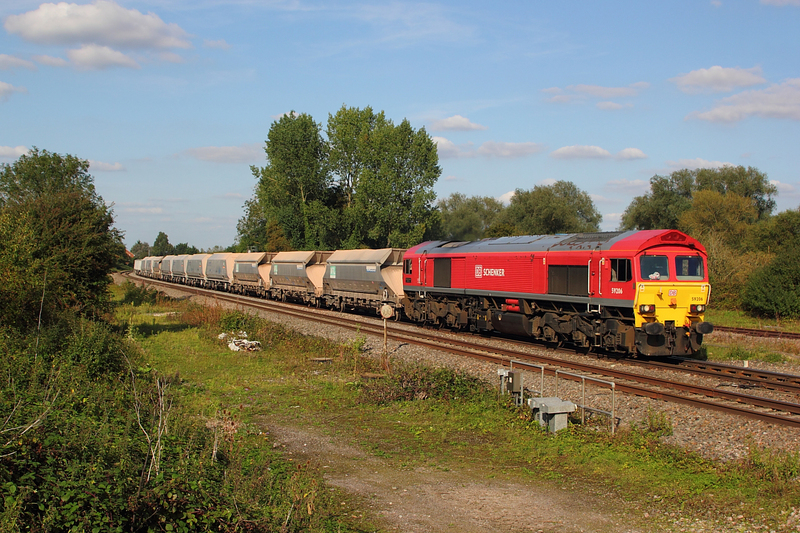 59001"Yeoman Endeavour"+ 66003 7A09 Merehead to Acton loaded stone. On a day off mainly cloudy sky it was down to luck to get anything in the sun,and god knows where this unexpected shaft of sunlight come from at the right time for 59103 "Village of Mells" on 7C77 Acton to Merehead empties,so im awaiting the usual run of bad luck to compensate. 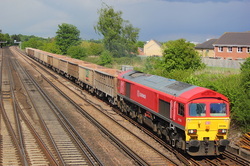 59204 7C77 Acton to Merehead empties. 59202"Allan Meadows Taylor MD Mendip Rail" 6C54 Oxford Banbury Road to Whatley empty box wagons. 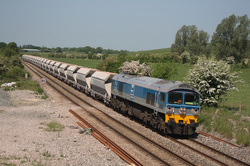 59202"Vale of White Horse" 6C48 Appleford to Westbury empty box wagons. 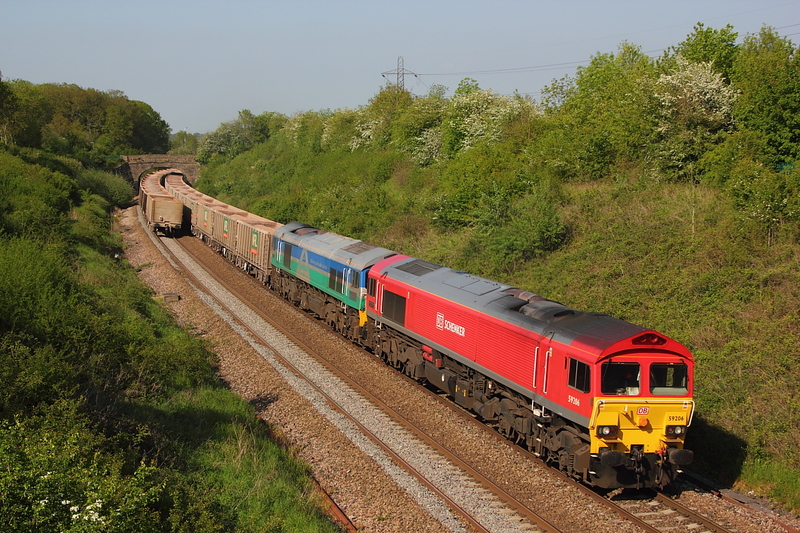 59201..6C48 Appleford to Westbury empties. 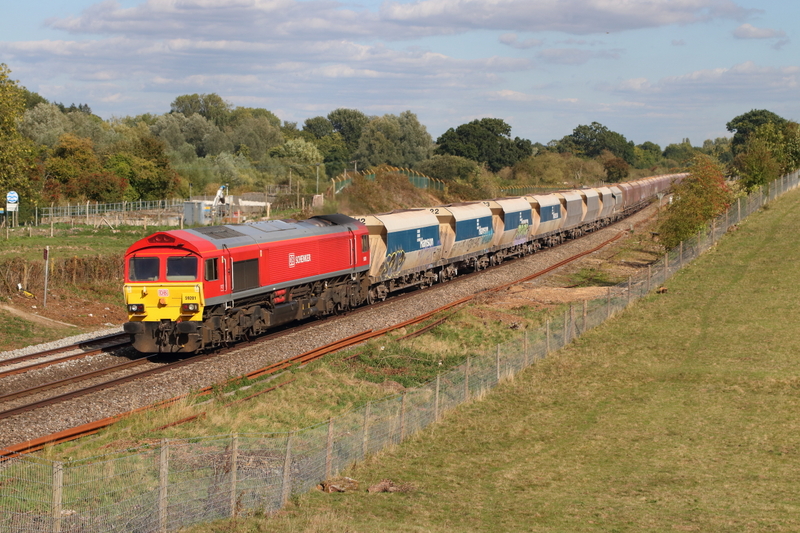 59004"Paul A Hammond" 7A09 Merehead to Acton loaded stone. 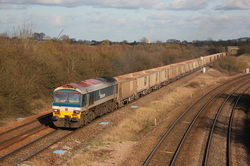 59005"Kenneth J Painter" on 6V12 Woking to Merehead empty box wagons with 37402 in the distance having just passed on a Weymouth to Clapham working with inspection saloon "Caroline"
59206"John F Yeoman,Rail Pioneer",is about to cross onto the main and Salisbury line after a brief stop further back(Usually takes the direct main line,avoiding a stop)....and then proceeds with 7V12,the Woking to Merehead empties turn. 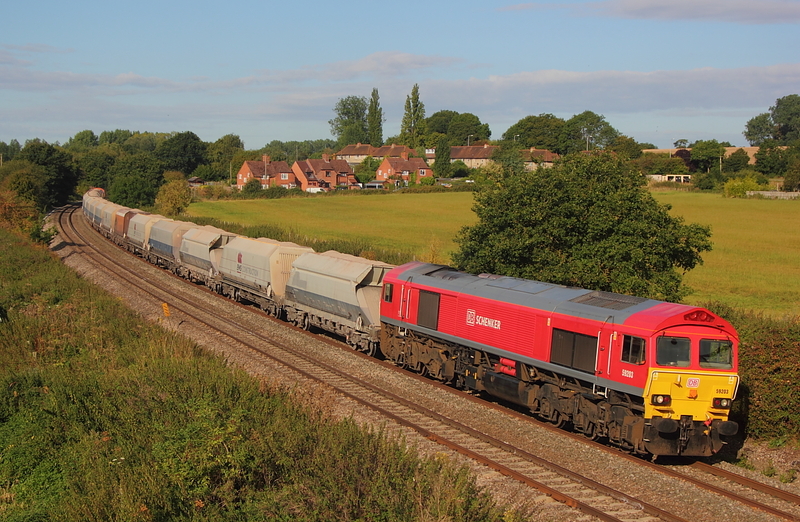 Hanson 59101 passes under a hazy sky on 7C54 Oxford,Banbury Road to Whatley empties. 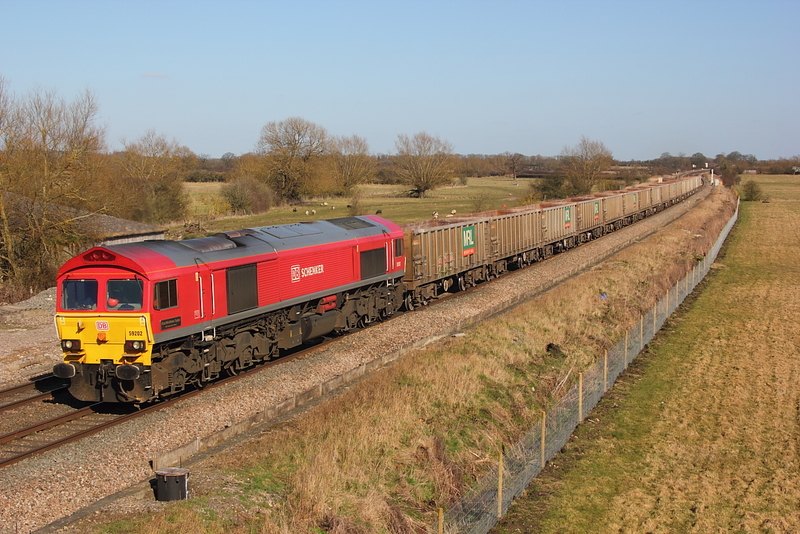 Having rode my luck so far today,a mad dash to Woodborough,was greeted with a horn blast in the distance whilst getting out of the car,so managed to get of a shot of a Saturday 7C77 Acton to Westbury empty box wagons,with 59202 at the helm and 66060+66140 DIT.Having not fired the camera in anger for a good two months,id better lay it up again because in this pastime theres always payback time. 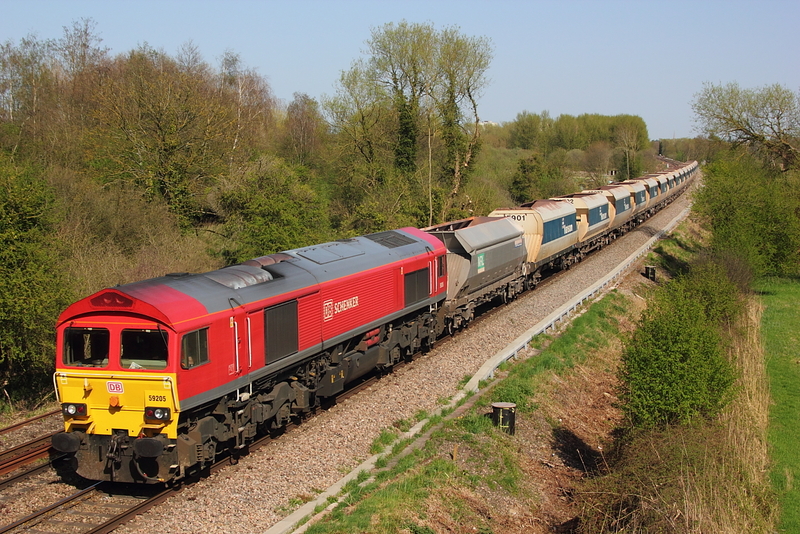 A surprise 6Z71 Whatley to Acton Mendip aggregate working on a Saturday passes Newbury,in the hands of freshly painted 59203+59101"Village of Whatley",in a not so fresh livery. 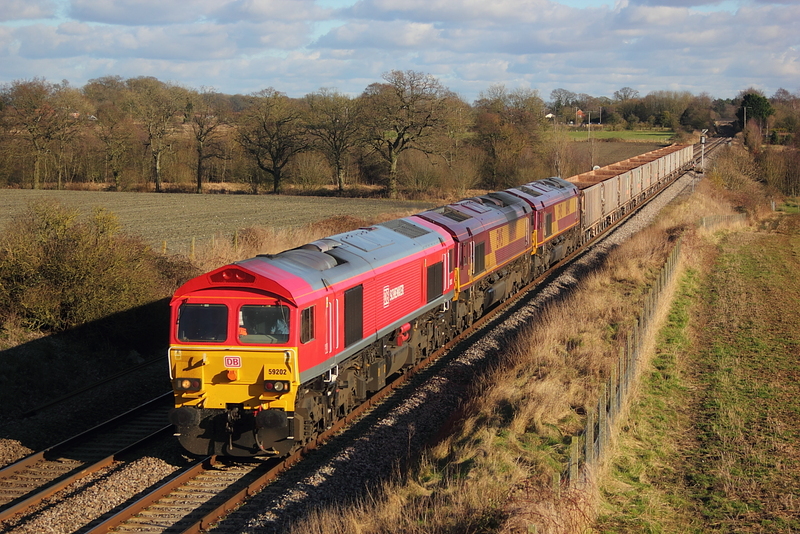 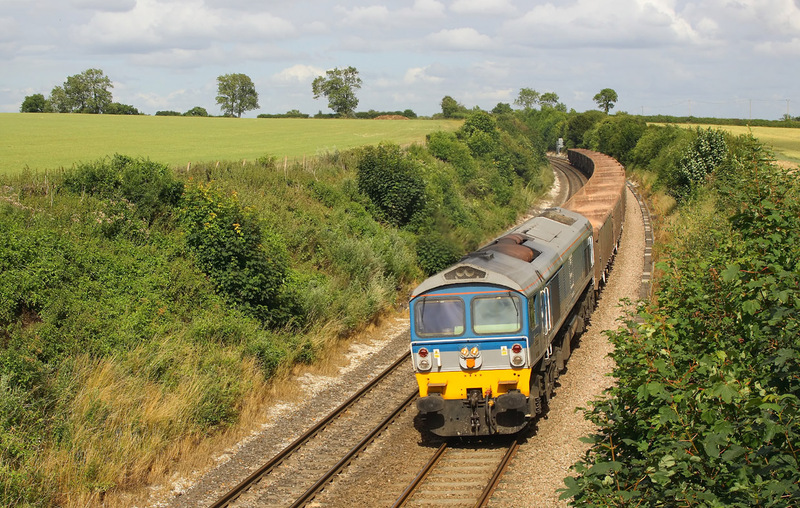 59203"Vale of Pickering"+59102,6C31 Theale to (WO) Whatley empties. 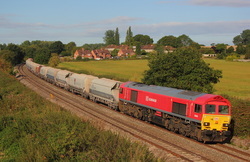 Another Hanson,this time 59102"Village of Chantry" rounds the curve at Crofton on 6A74 Whatley to Theale loaded Hanson hoppers. 59101"Village of Whatley"7A09 Merehead to Acton. 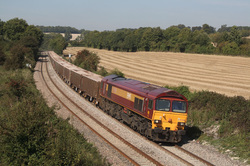 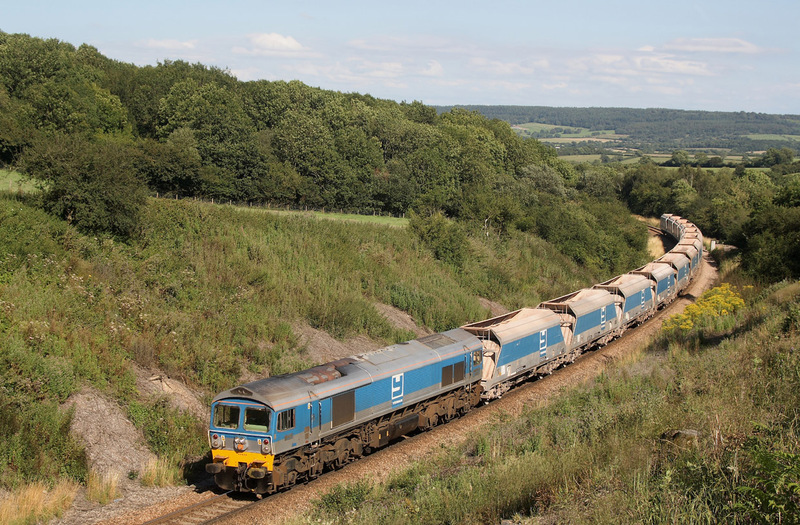 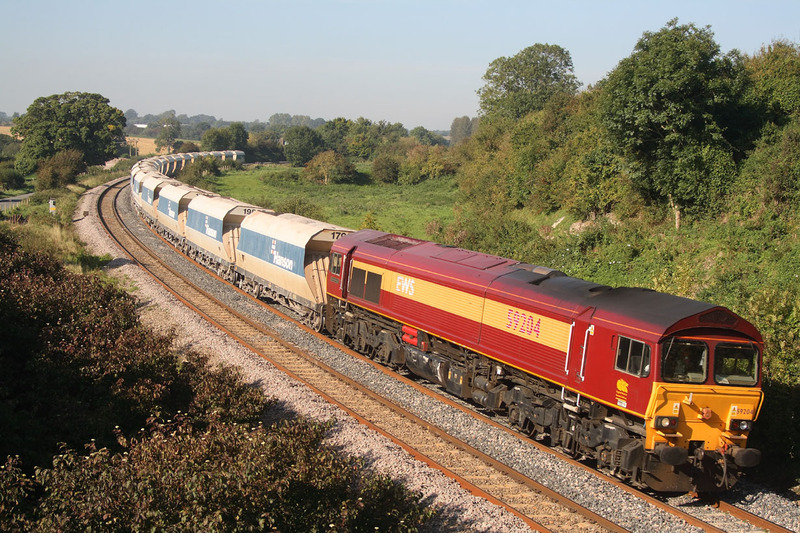 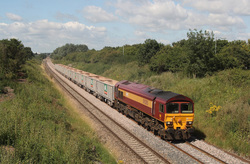 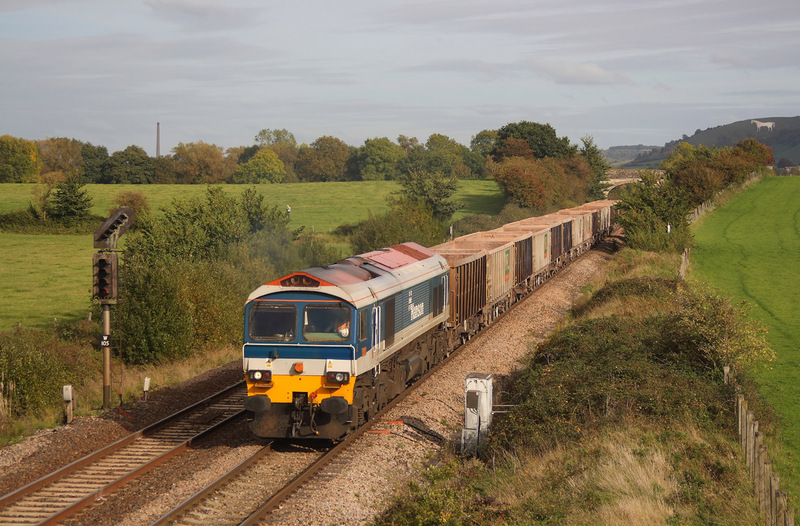 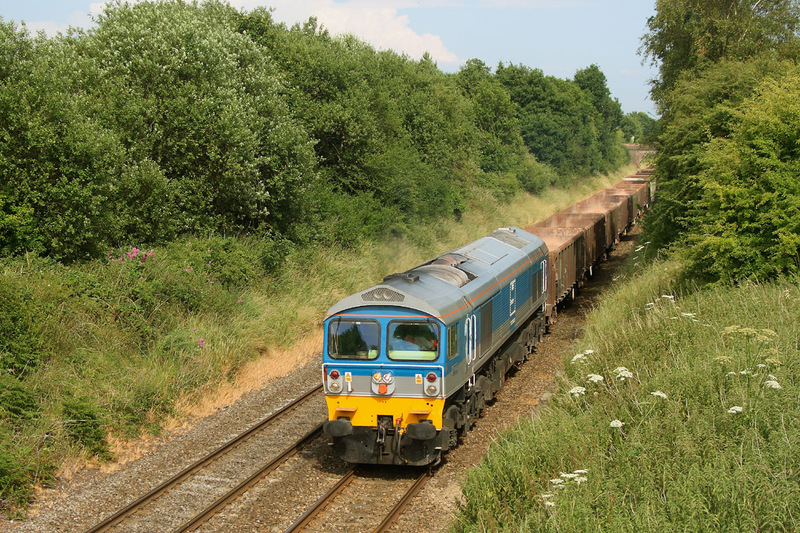 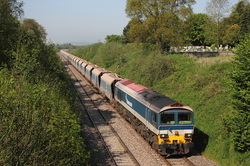 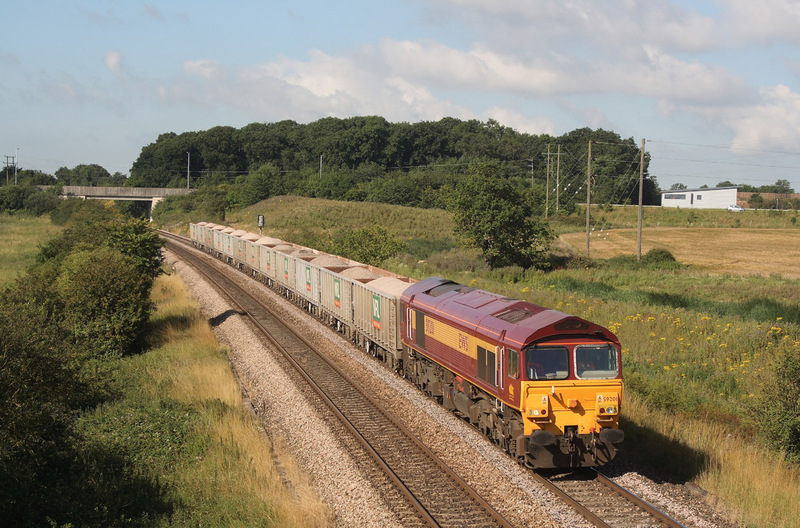 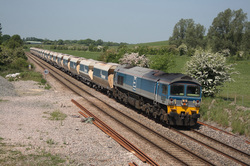 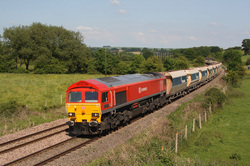 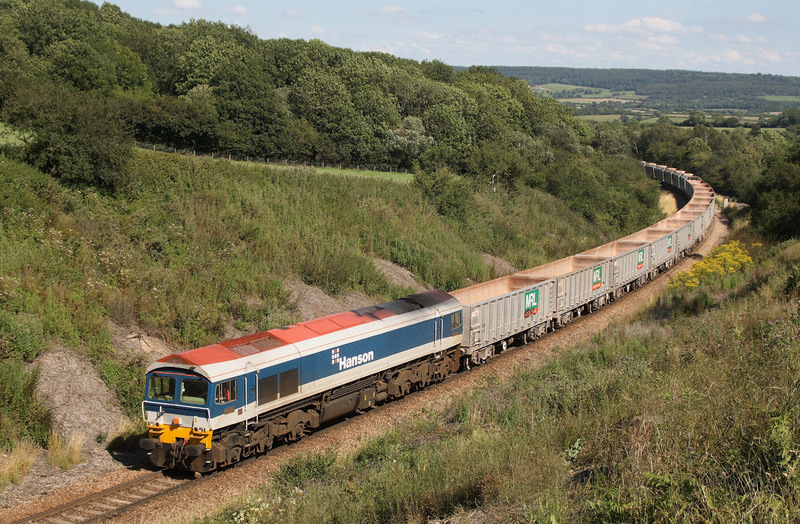 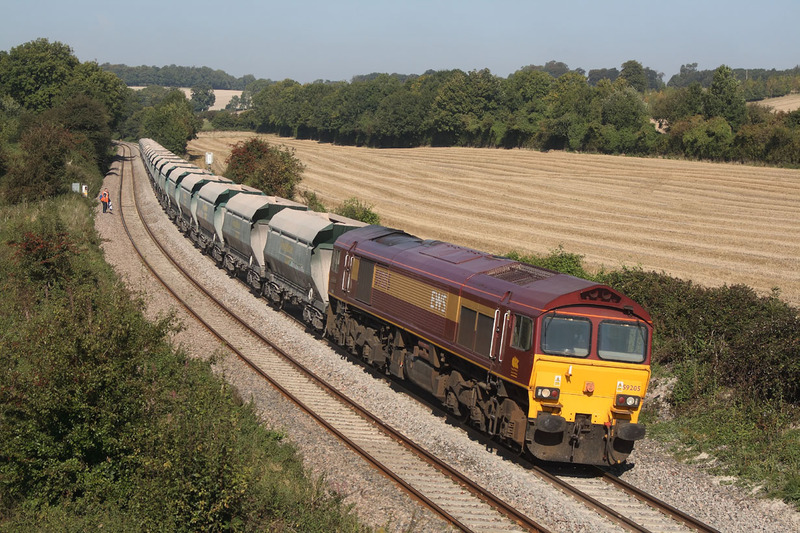 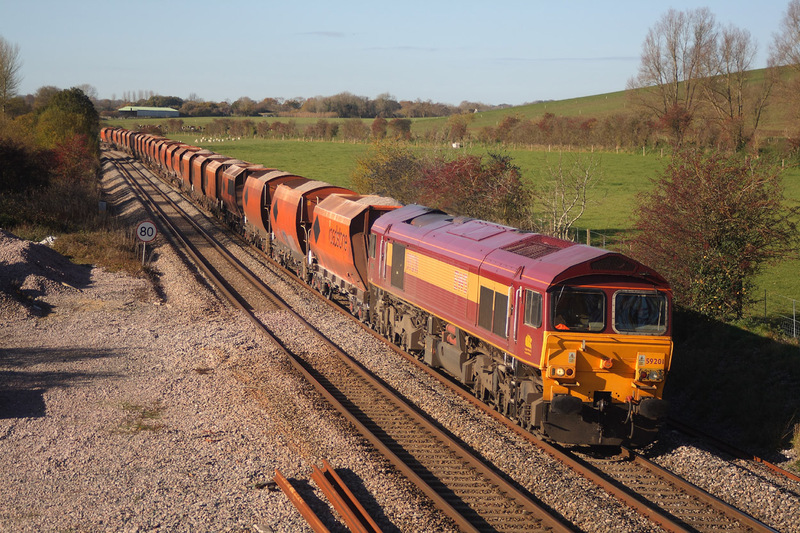 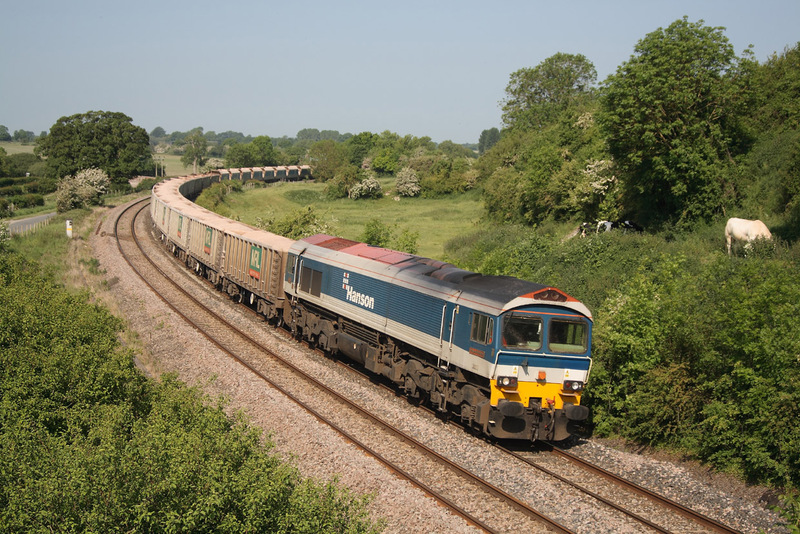 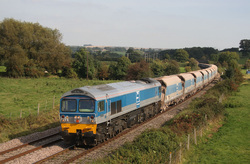 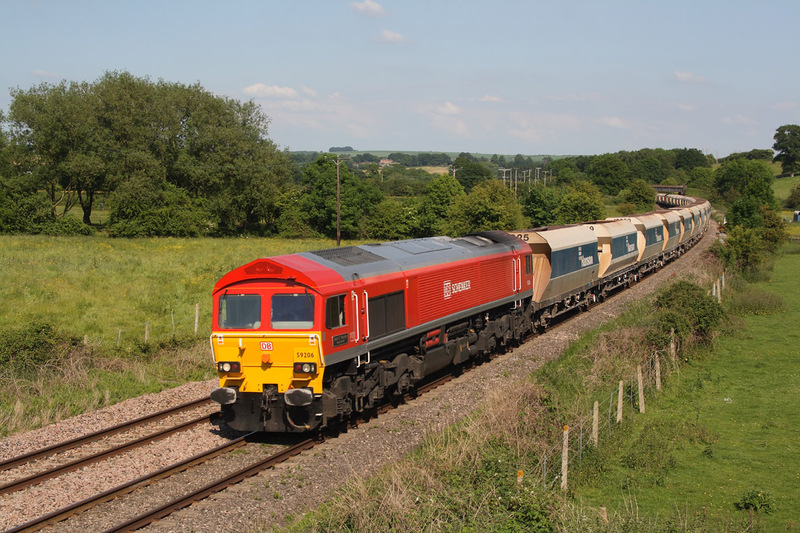 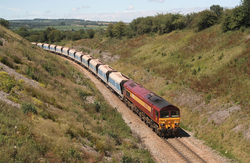 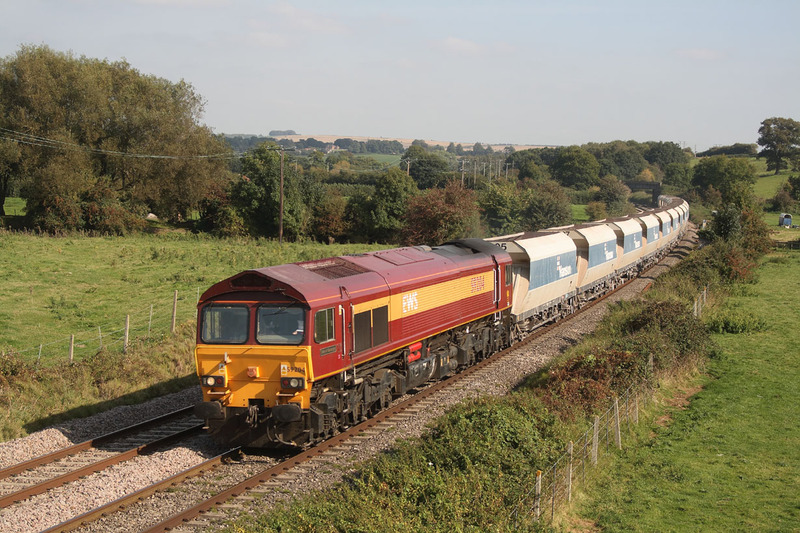 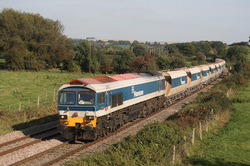 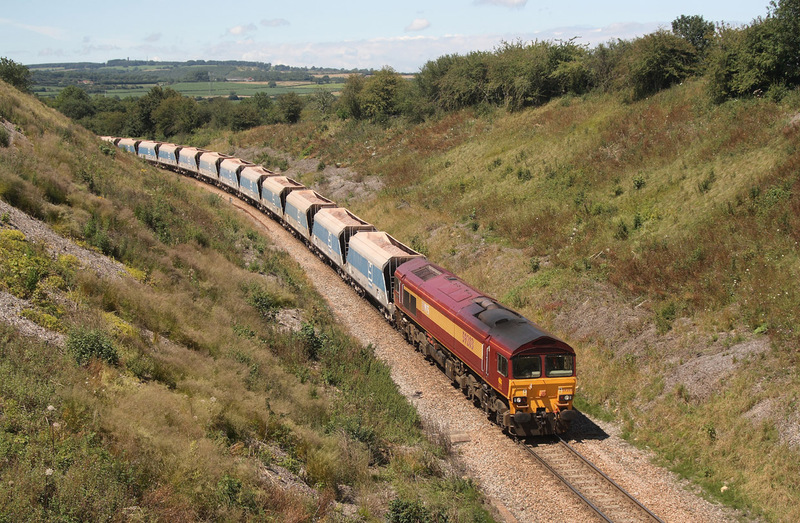 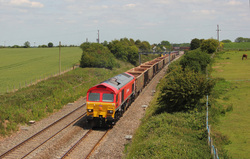 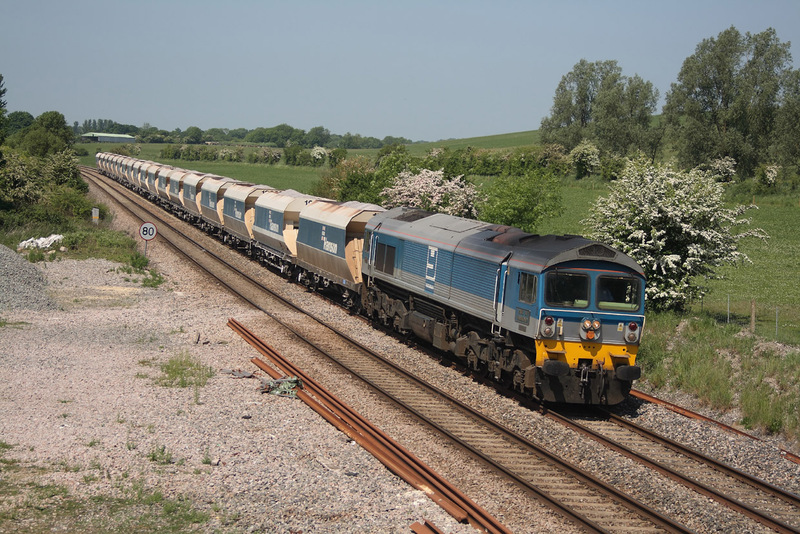 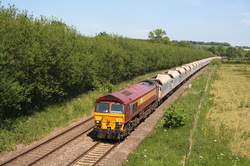 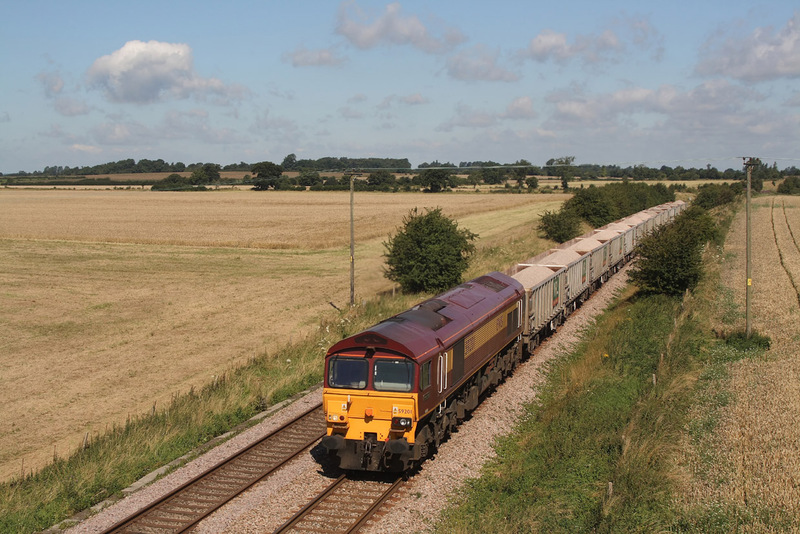 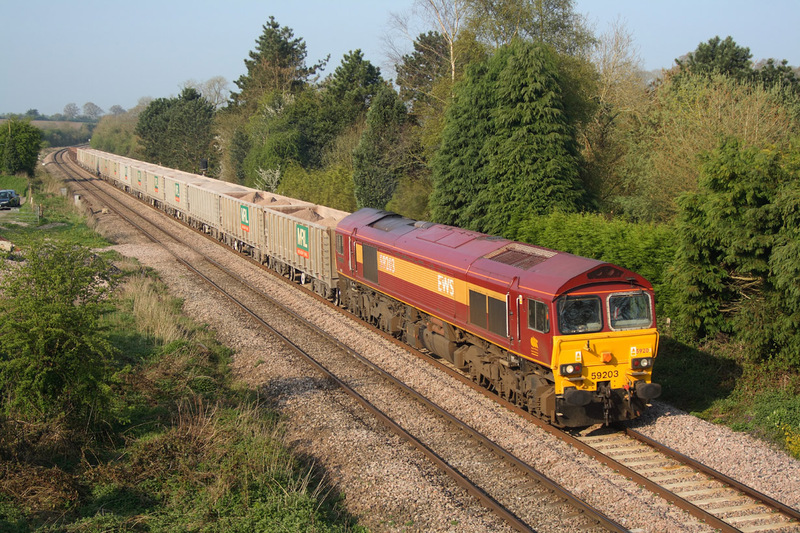 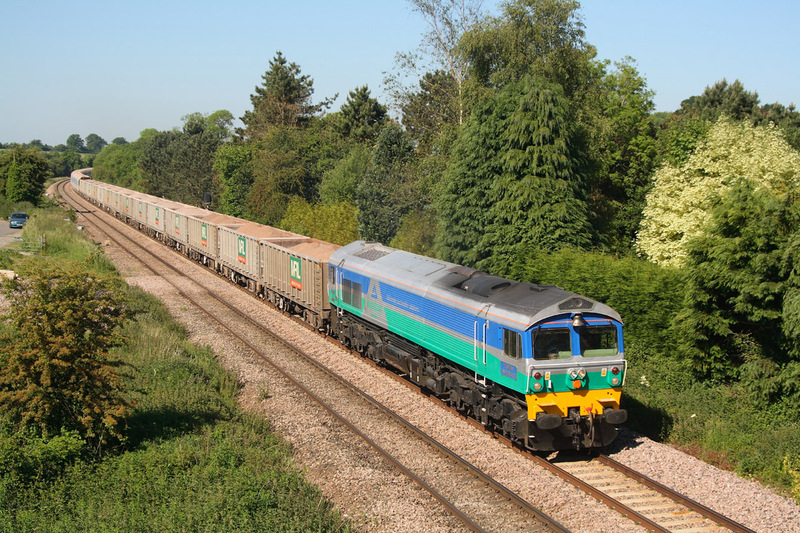 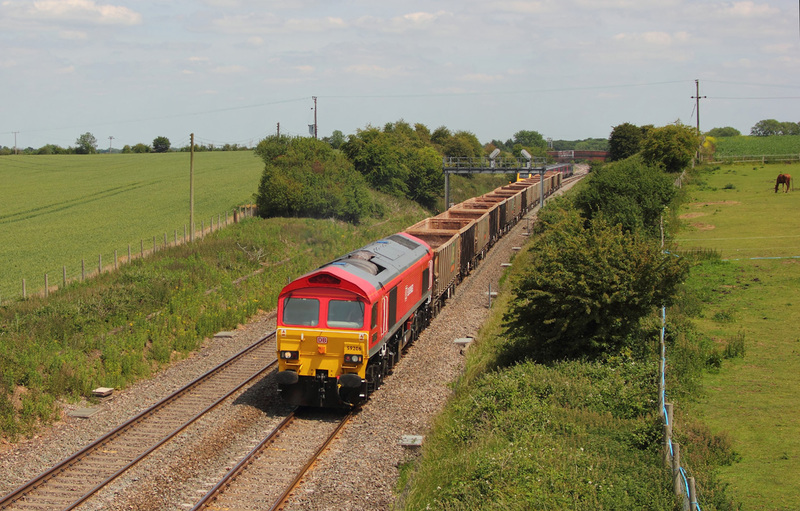 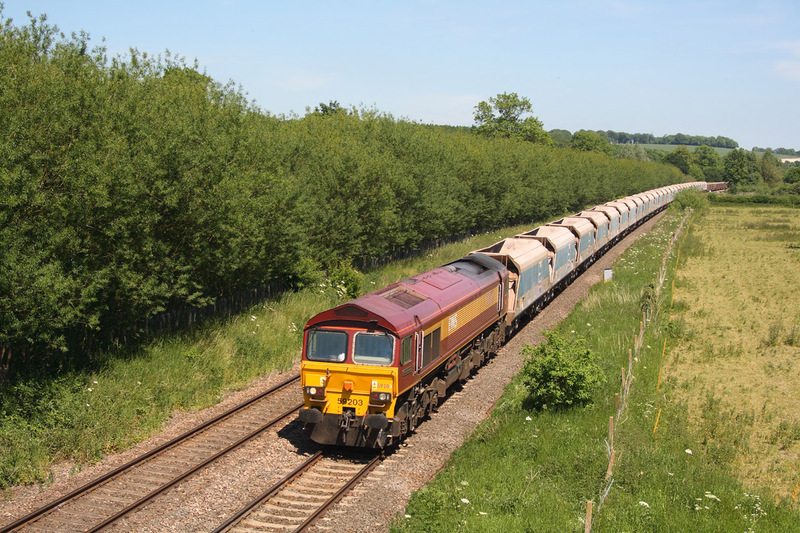 59206"John F Yeoman,Rail Pioneer"7C48 Appleford to Whatley passing Bourton with empty box wagons. 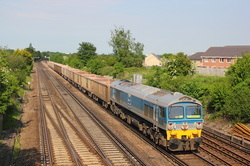 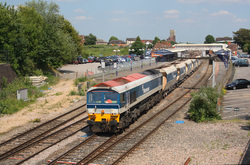 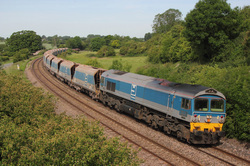 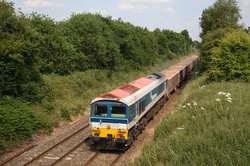 14/06/11 Crofton..59004 "Paul A Hammond"7A09 Merehead to Acton. 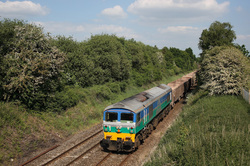 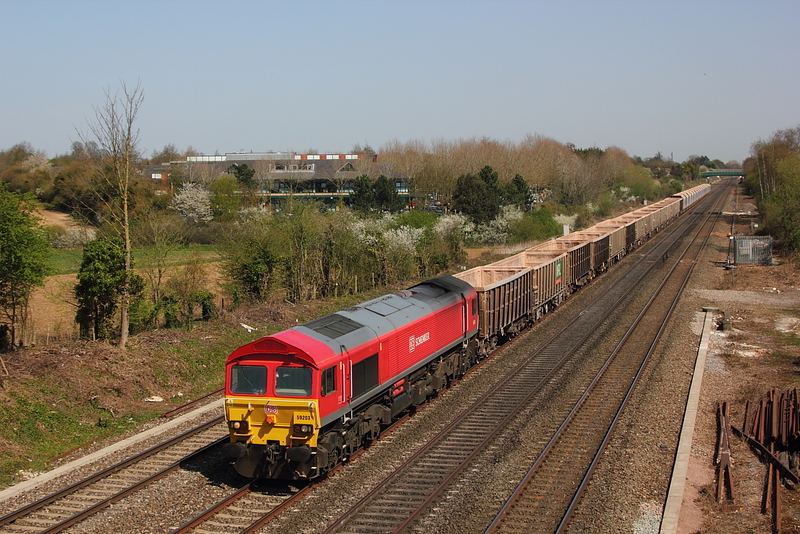 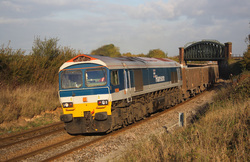 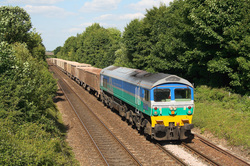 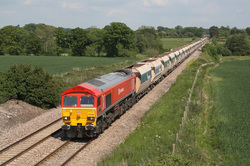 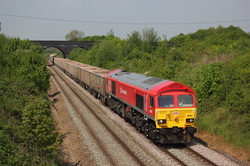 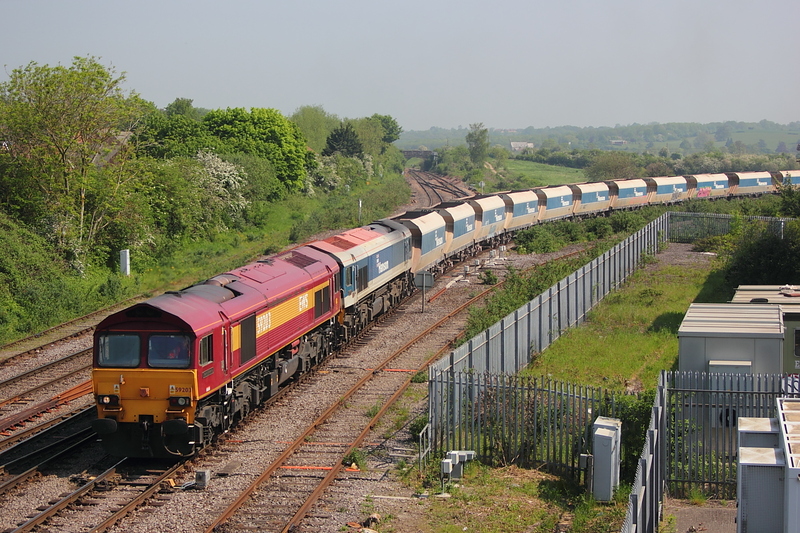 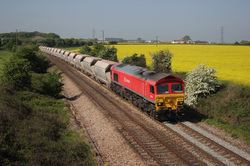 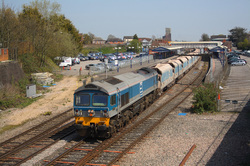 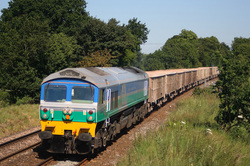 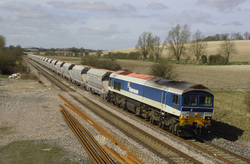 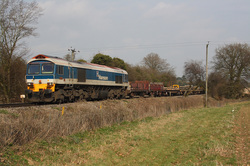 28/04/11 Berkley Marsh..59206 "John F Yeoman,Rail Pioneer" 7A17 Merehead to Acton. 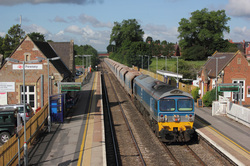 Passing through Pewsey station is 59002"Alan J Day" on 7A09 Merehead to Acton. 28/04/11 Wooton Rivers.."59204 Vale Of Glamorgan" 7AO9 Merehead to Acton. The class 59's do use the route through Basingstoke,ie the Woking stone,and will take the Salisbury line,however the class is relatively rare on the Southampton line and a engineers train will probably be it,as in this instance,with 59104" Villlage of Great Elm" passing Oakley on 6N05,Stoats N.Jnct to Eastleigh yard sunday engineers. 59104"Village of Great Elm"7A17 Merehead to Acton loaded stone. 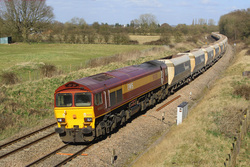 59201"Vale of York" 6M20 Whatley to St. Pancras loaded ex RMC hoppers. 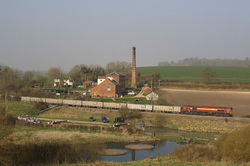 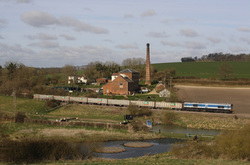 59102"Village of Chantry" rounds the curve at Crofton,passing the pumping station on 7A09 Merehead to Acton loaded stone. 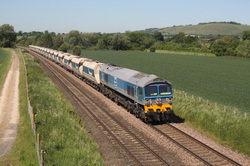 59101"Village of Whatley"7V07 Chichester to Merehead empties. 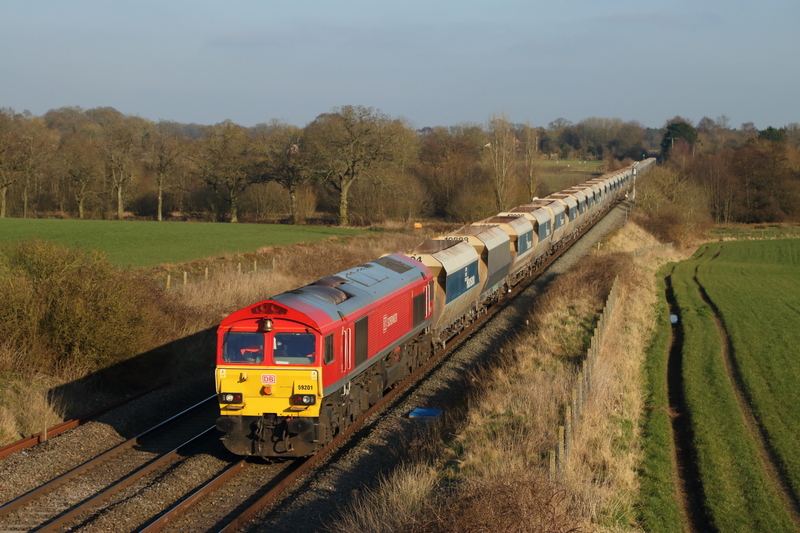 With the light just about hanging on ,59101"Village Of Whatley" passes Manningford Bruce with 6V18,Hither Green to Whatley empties,with the front section containing ex RMC hoppers. 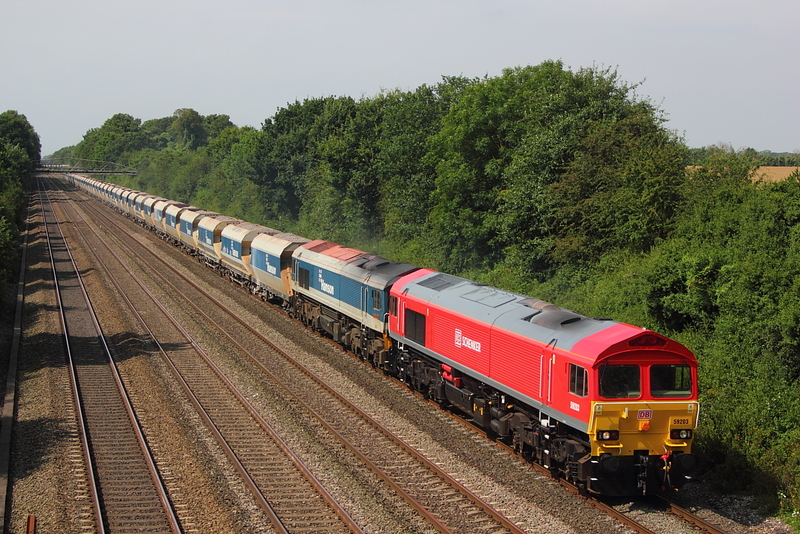 59002"Alan J Day"7C77 Acton to Merehead empties. 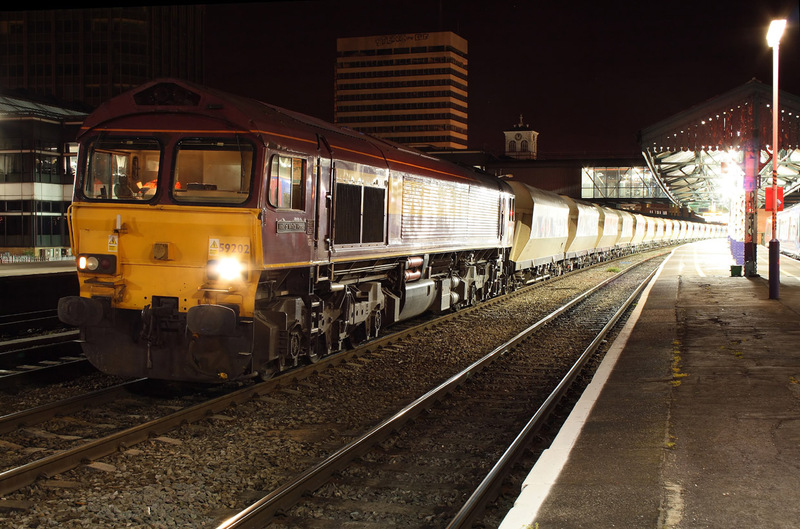 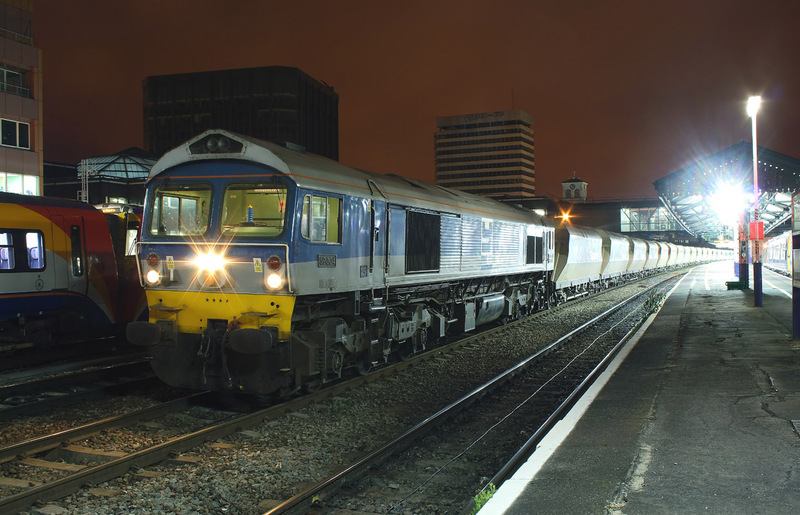 59004"Paul A Hammond"sits on a red at Reading, awaiting the departure of a unit in the bay platform,before continuing its journey with 6A20,Whatley to Acton loaded Hanson hoppers. 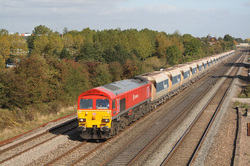 59005 "kenneth J Painter"6V12 Woking to Merehead empties. 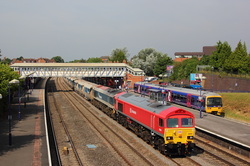 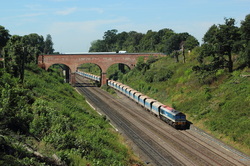 The footbridge just north of Andover station,allows a shot of 6V12,the return Woking to Merehead empties, passing at the usual time ,just behind a Waterloo to Exeter unit,however this is only acheivable during the June/July period due to the angle of the early evening sun.The times i have tried this shot,only to find its ran on the earlier allocated slot,but today everything went to plan as 59005"Kenneth J Painter" passed . 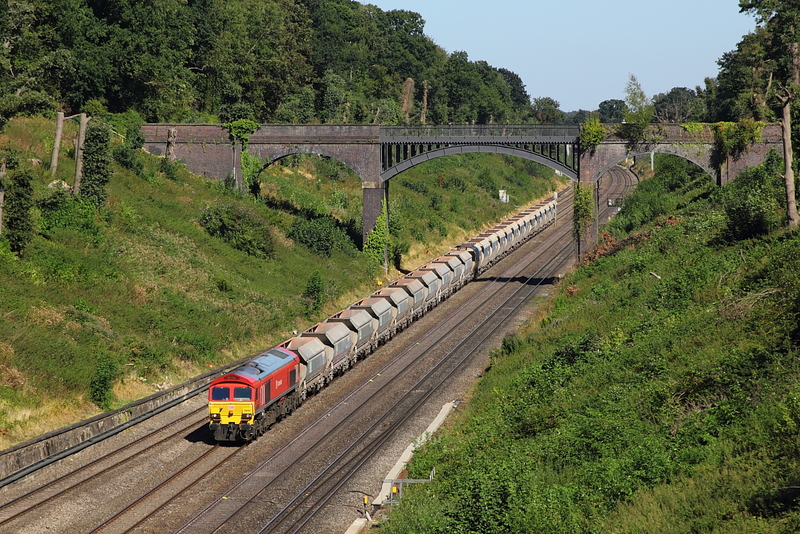 59103"Village of Mells" 6V18 Hither Green to Whatley empties. 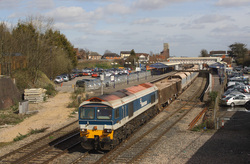 59005"Kenneth J Painter" sits awaiting a Green at Newbury on 7C77,Acton to Merehead empties. 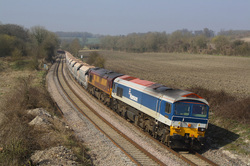 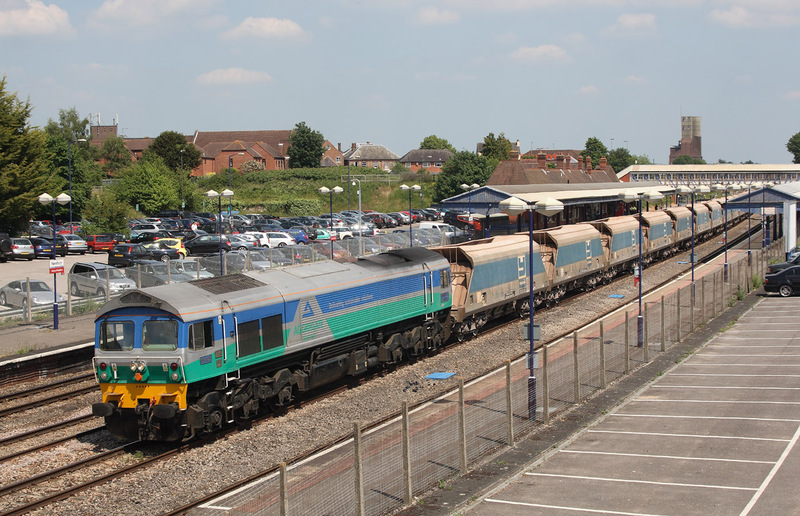 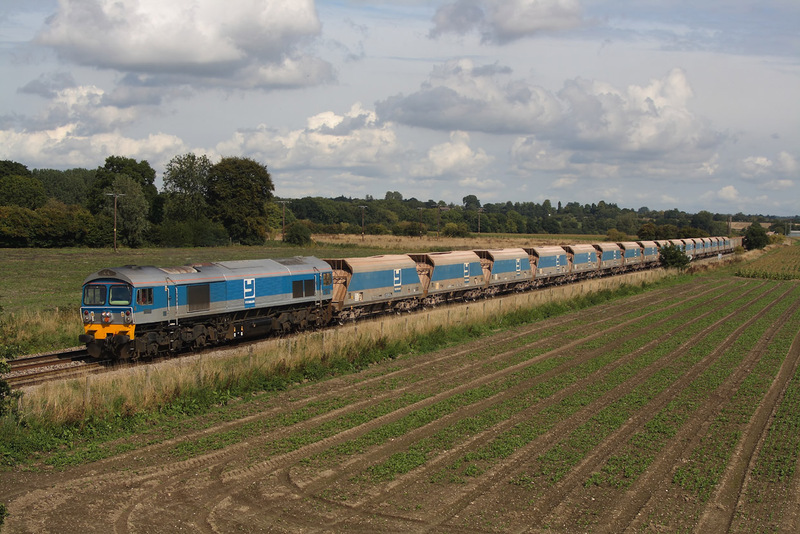 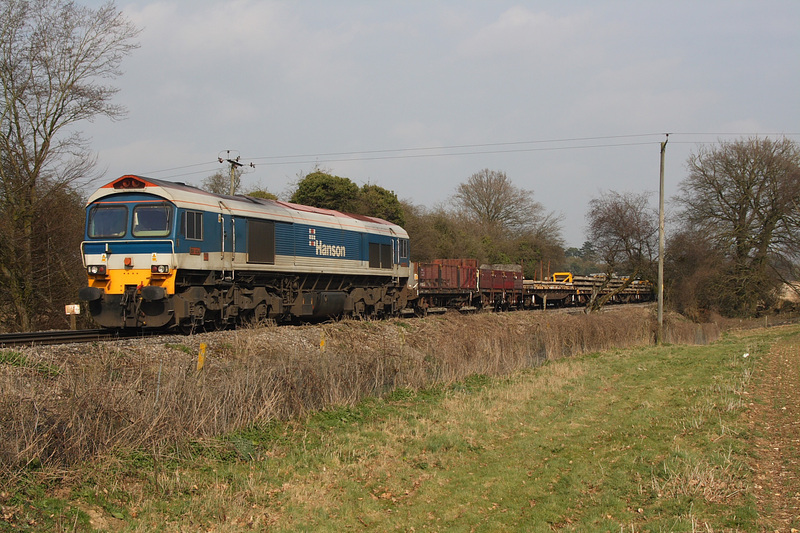 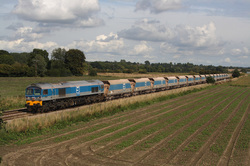 59004"Paul A Hammond" 6A74 Whatley to Theale loaded Hanson hoppers. 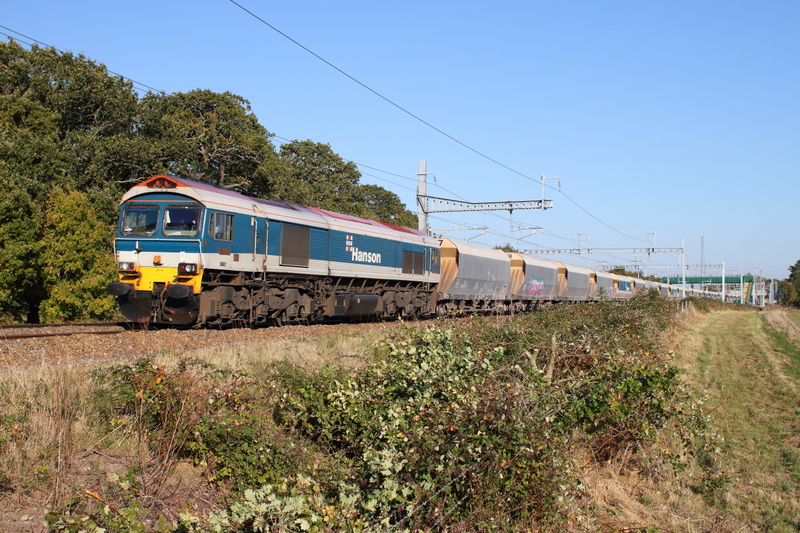 59002"Alan J Day"7A17 Merehead to Acton. 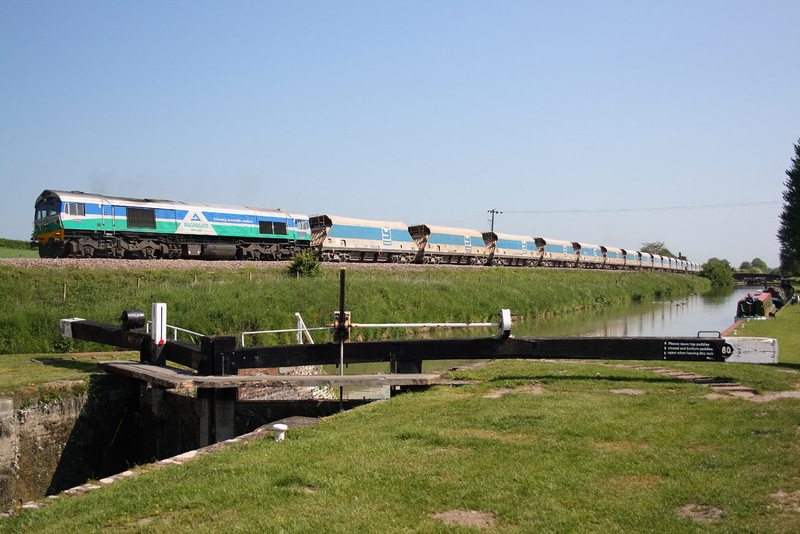 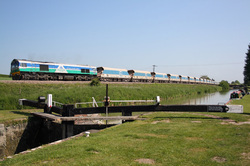 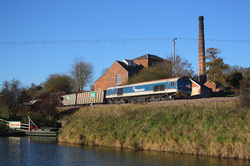 59001"Yeoman Endeavour" passes the canal locks at Crofton whilst working 7C31 Theale to Merehead empties. 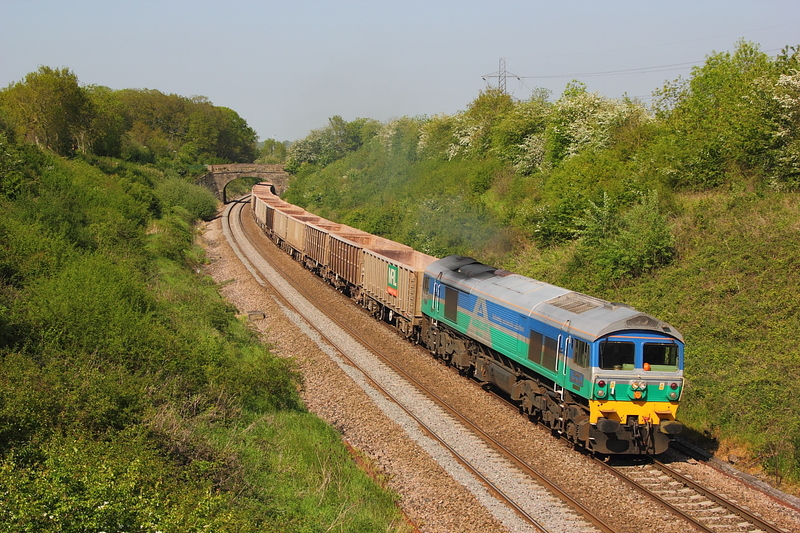 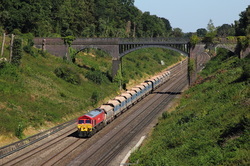 59101"Village of Whatley" rounds the curve at Crofton ,working 7AO9 Merehead to Acton aggregate service. 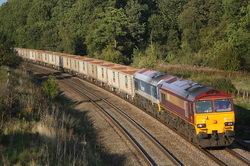 59005"Kenneth J Painter"7V12 Woking to Merehead empties. 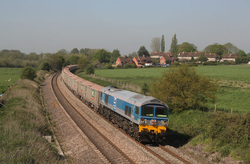 59202"Vale of White Horse"6A20 Whatley to Acton. 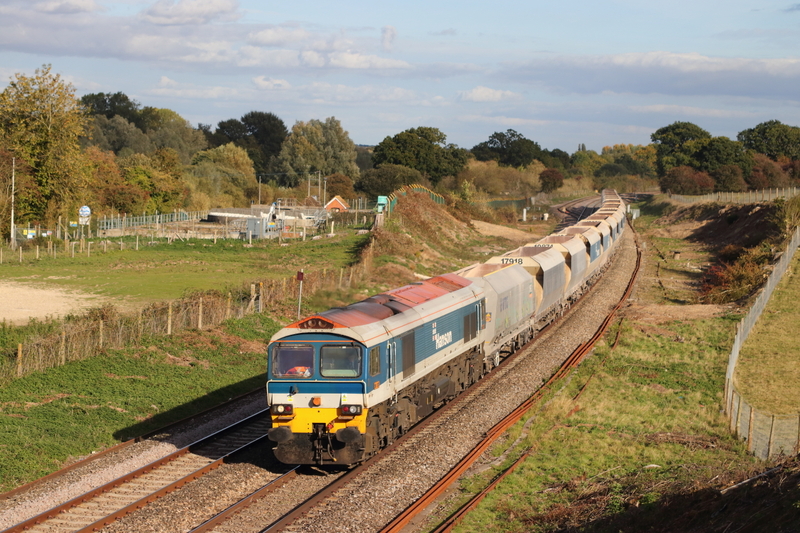 59004"Paul A Hammond" 6C77 Acton to Merehead empties. With the trial of a Class 59/2 on the Robeston to Westerleigh tanks taking place,59204"L Keith Mc Nair"+66067 PASS Charfield with a Saturday 6B13 with loaded Murco tanks.Time would show a change back to the logical Class 60 for haulage. With the angle of the sun so much better this time of your for this working,59101"Village of Whatley" passes under the flyover at Battledown on 6V12,the Woking to Merehead empties. 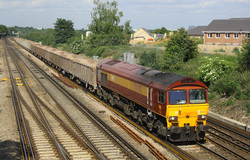 59206"John F Yeoman-Rail Pioneer"6V18 Hither Green to Whatley empties. 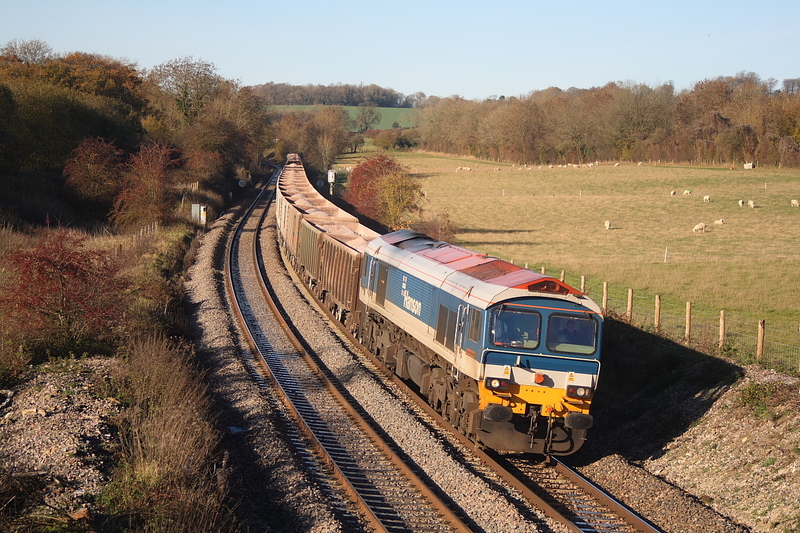 59205"L Keith Mc Nair"+59103"Village of Mells"6Z64..15.11 Bow to Westbury empties. 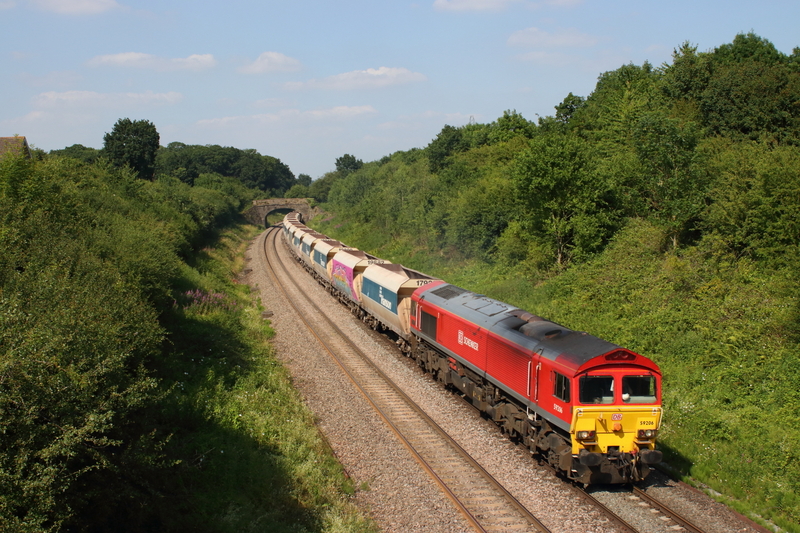 59203 "Vale of Pickering"6V12 Woking to Merehead empties. 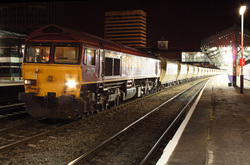 59201"Vale of York"6V12 Woking to Merehead empties. 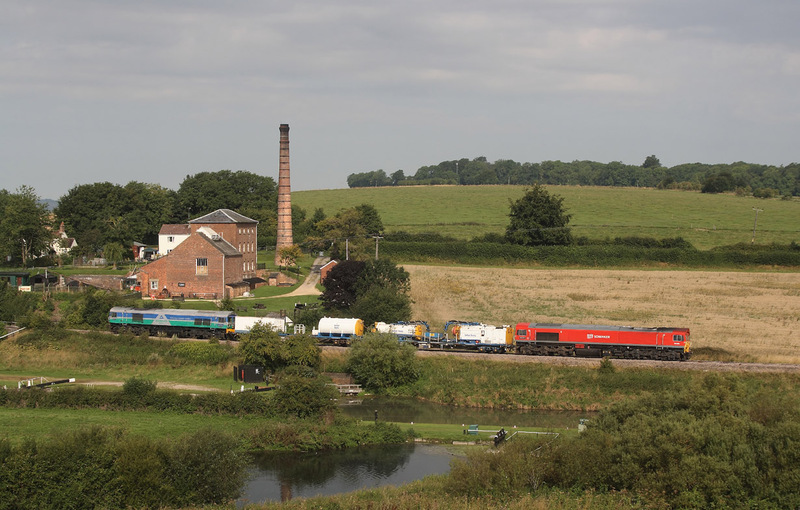 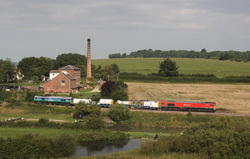 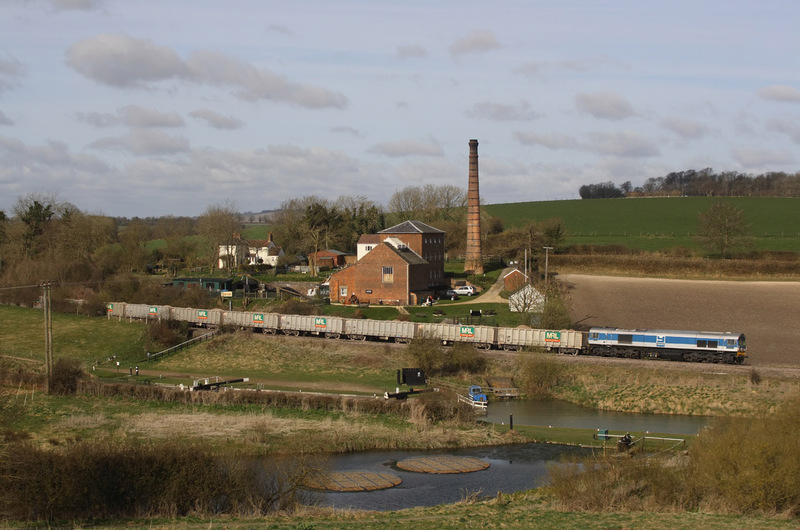 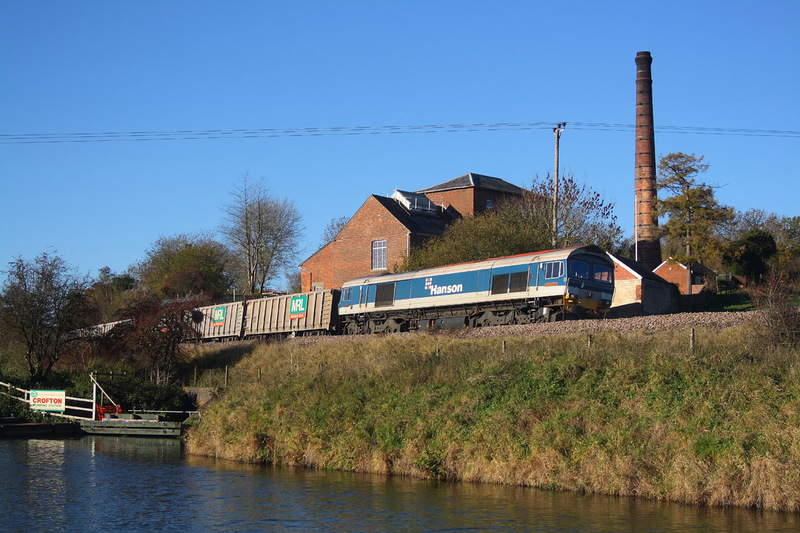 Fitting in perfectly between the Crofton pumping station and the canal,are top and tailed 59001"Yeoman Endeavour" and 59206"John F Yeoman-Rail Pioneer" on 6W12 Wooton Bassett to Westbury drain train. 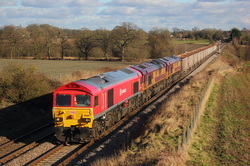 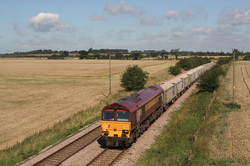 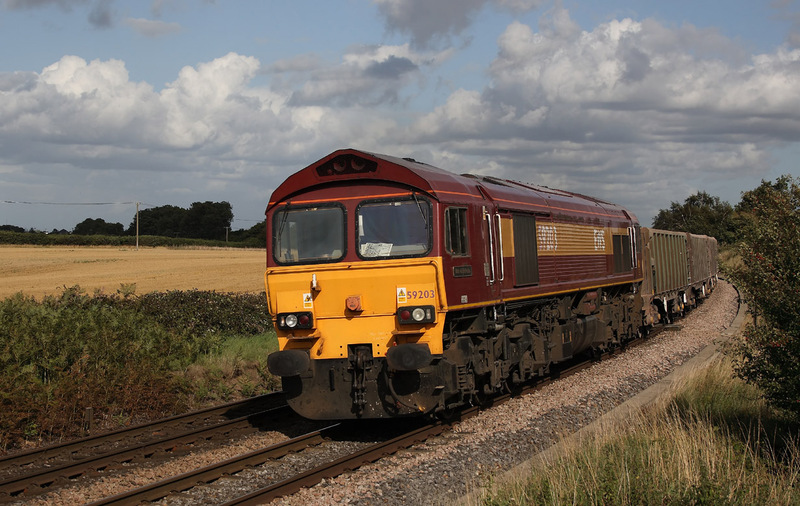 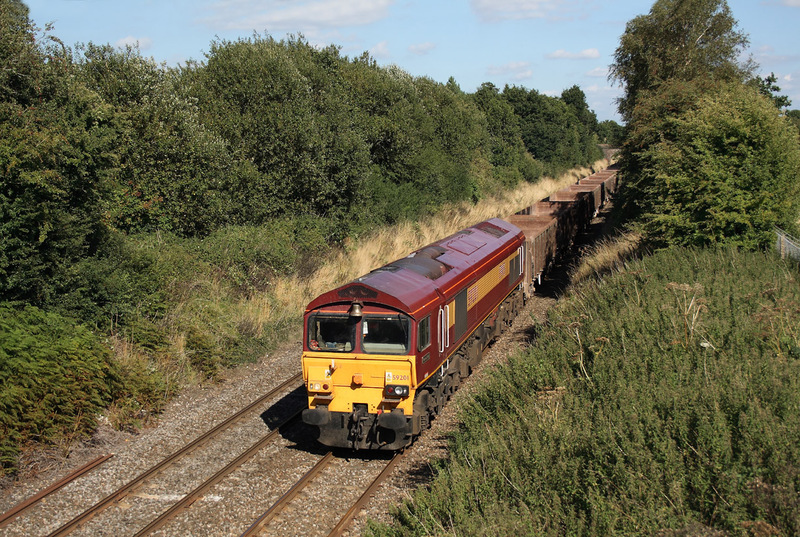 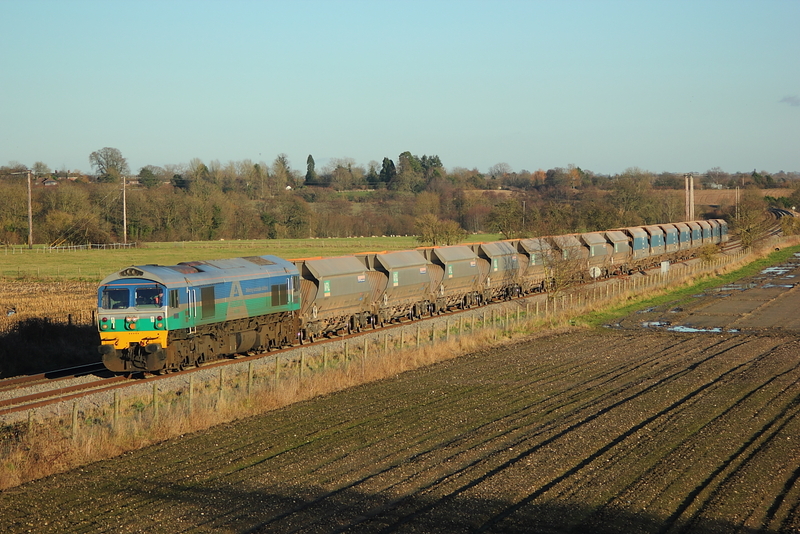 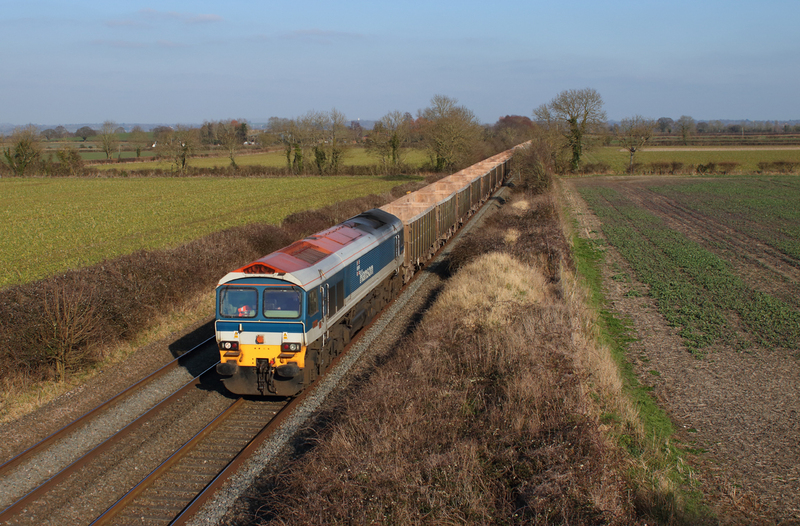 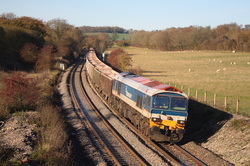 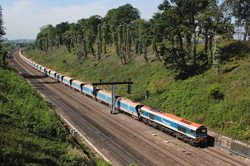 59005"Paul A Hammond" passes Deane,nr. Overton working 6V12 Woking to Merehead empties. 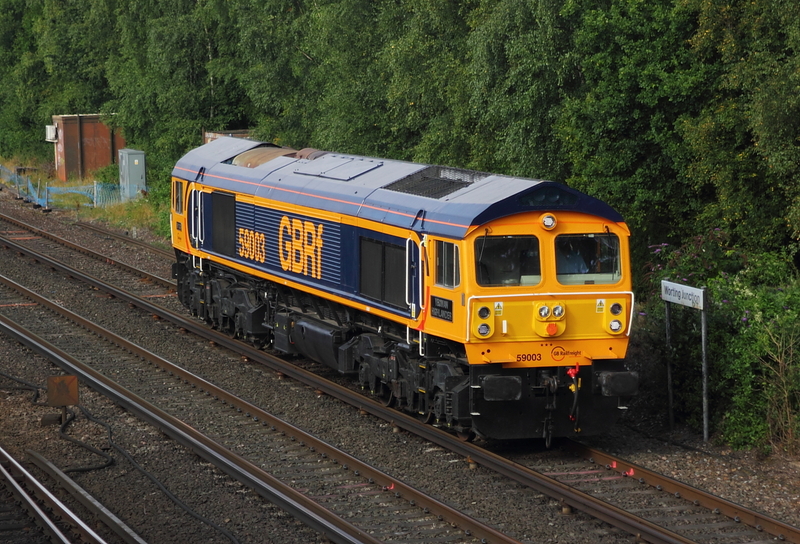 59002"Alan J Day" 6V12 Woking to Merehead empties. 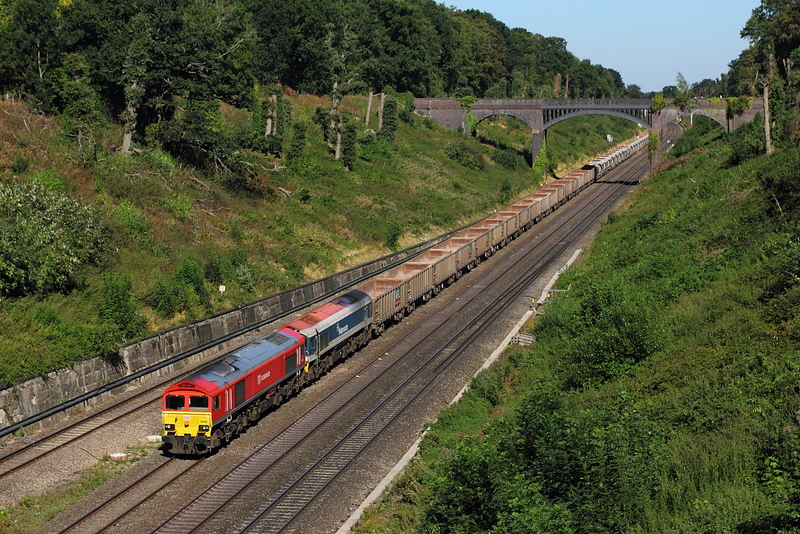 59103"Village of Mells" 6V12 Woking to Merehead empties. 59202"Vale of White Horse"6V12 Woking to Merehead empties. 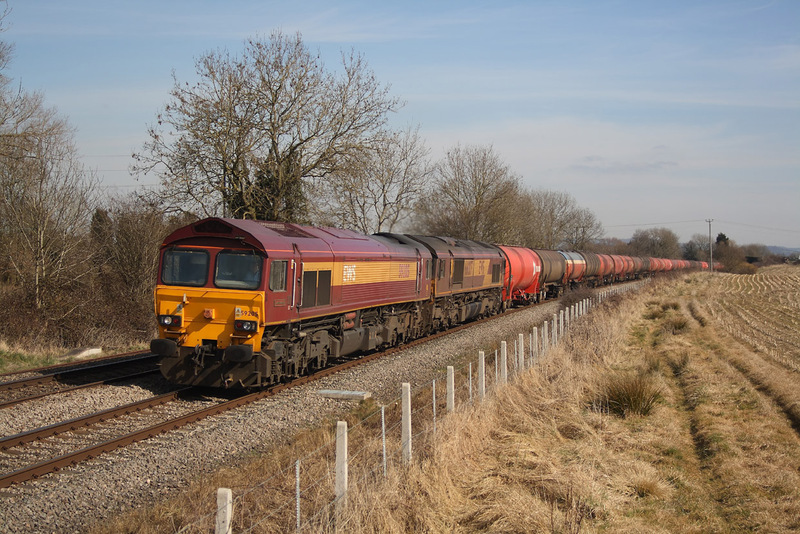 59203"Vale of Pickering"7C77 Acton to Merehead empties. 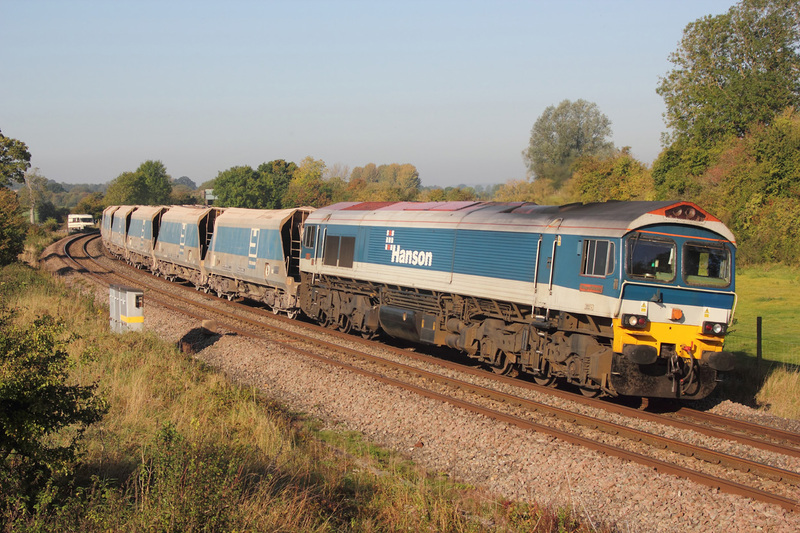 59001"Yeamon Endeavour"7A09 Merehead to Acton loaded stone. 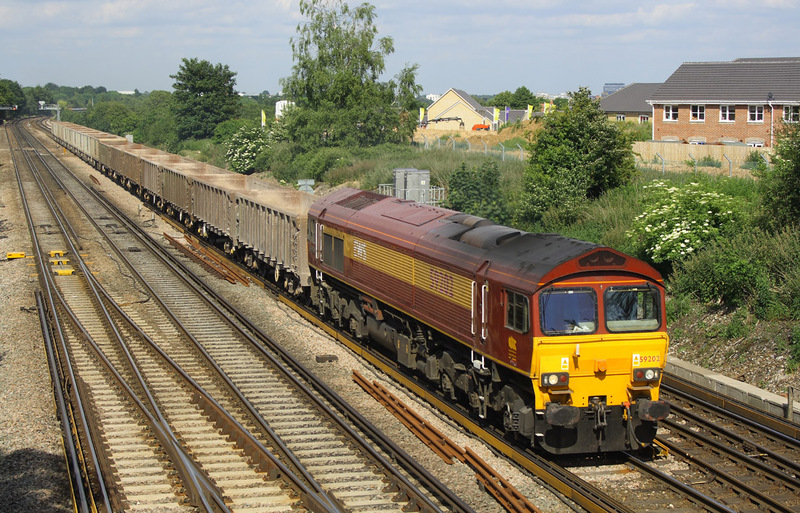 59206"John F Yeoman-Rail Pioneer"6V18 Hither Green to Whatley,Hanson empties. 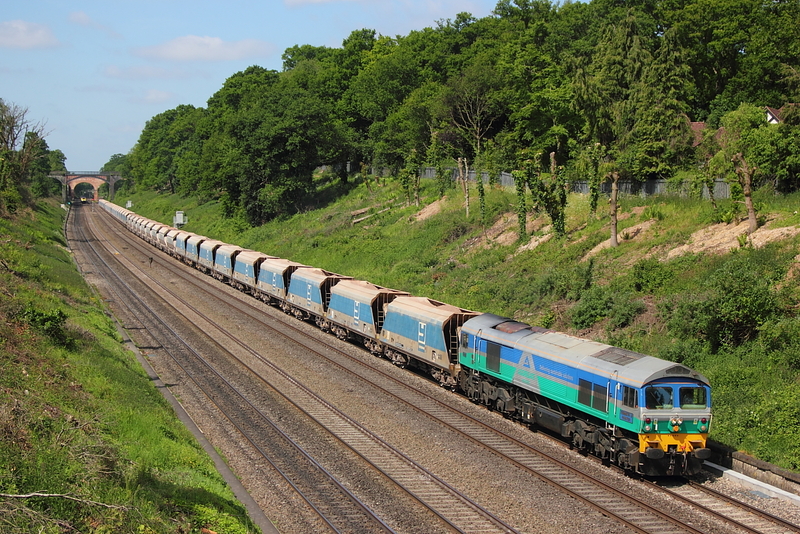 59103"Village of Mells" 7C77 Acton to Merehead empties. 59203"Vale of Pickering"7A09 Merehead to Acton. 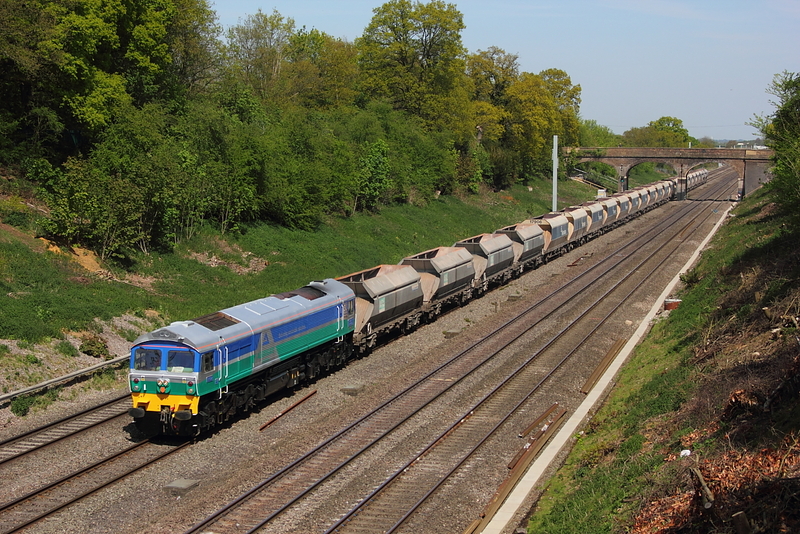 59205"L Keith Mc Nair"6V18 Hither Green to Whatley empties. 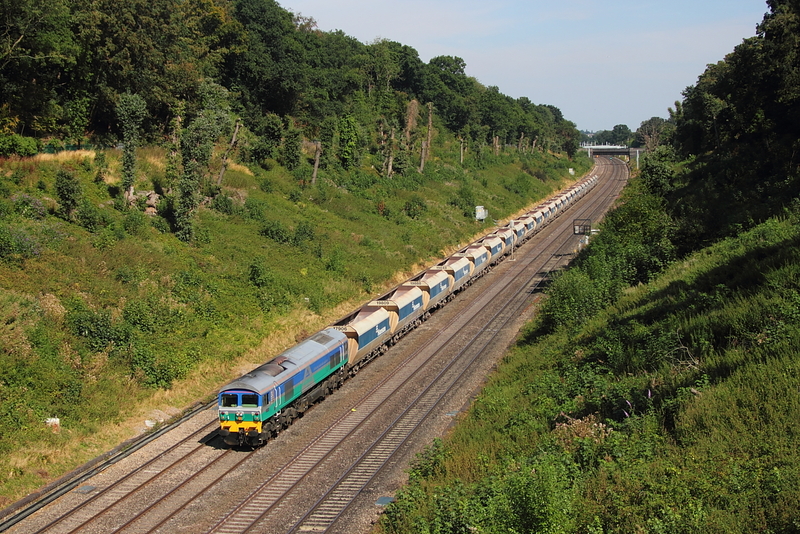 59102"Village of Chantry"7C77 Acton to Merehead empties. 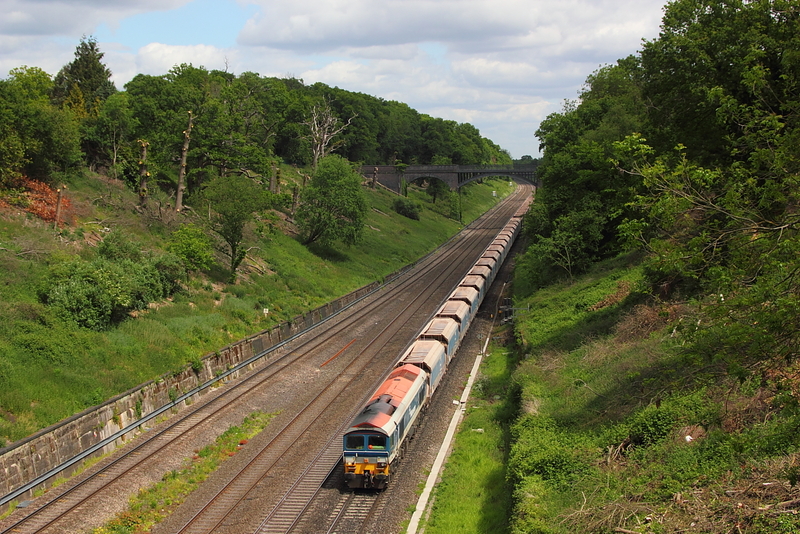 59103"Village of Mells" 7A17 Merehead to Acton. 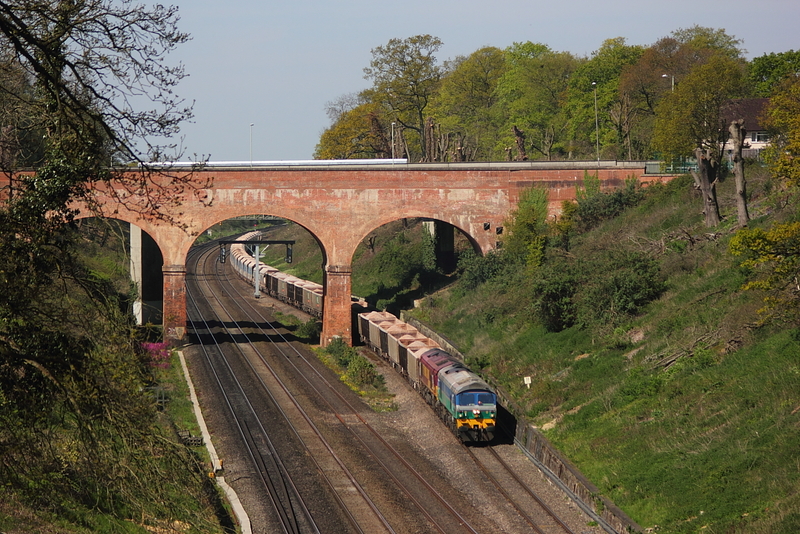 59002"Alan J Day"Passes the pumping station while working 7A09,the Merehead to Acton service. 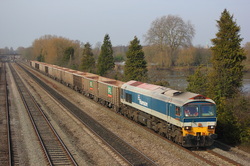 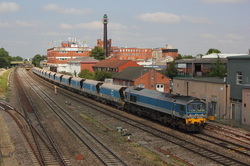 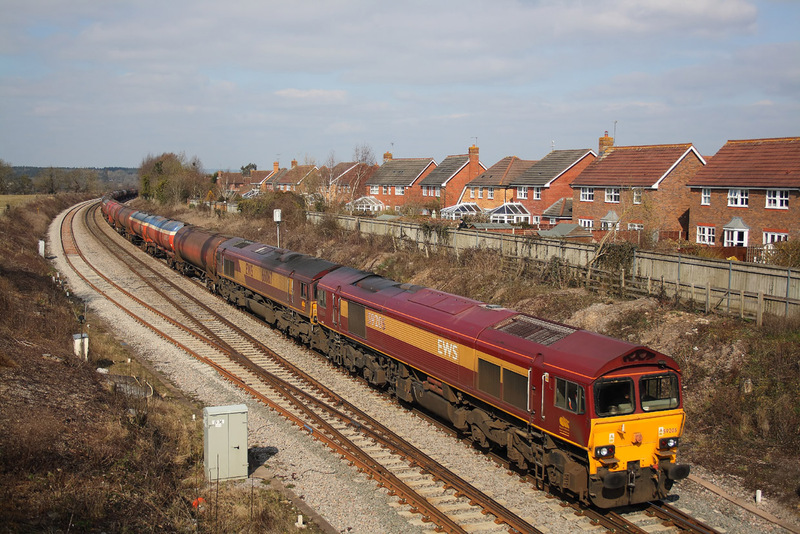 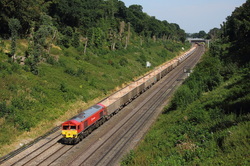 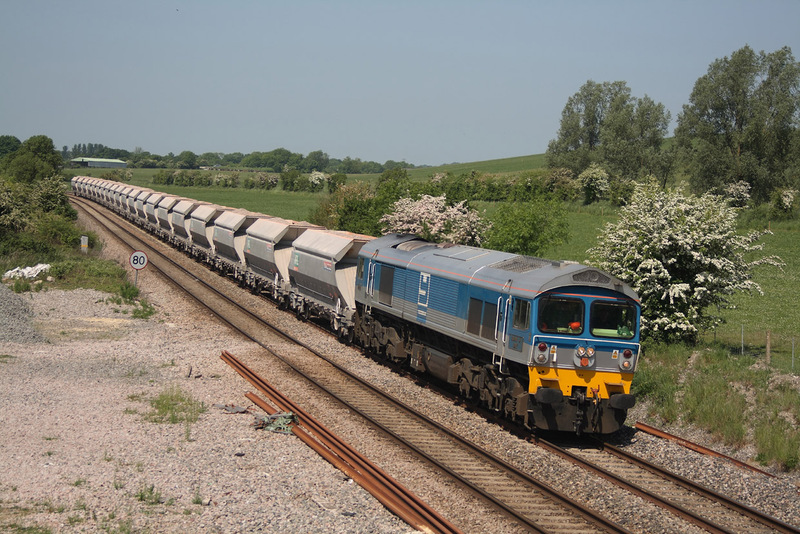 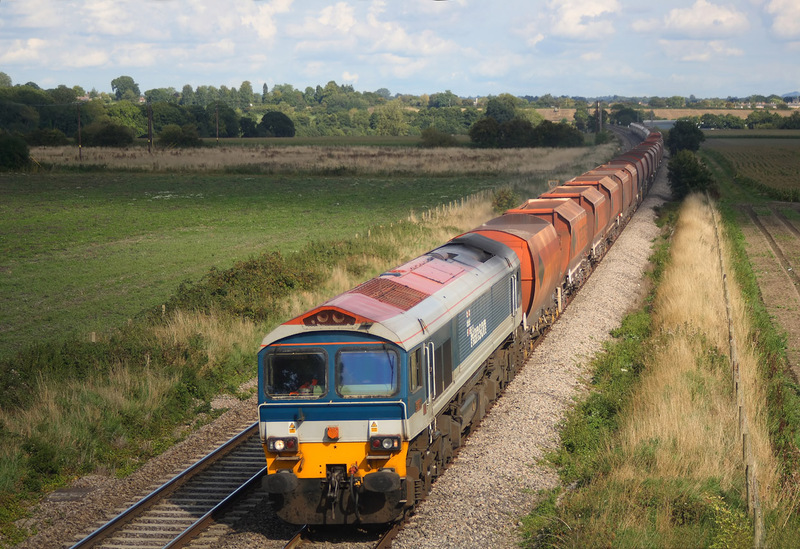 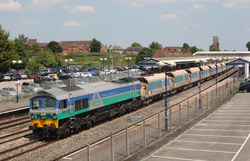 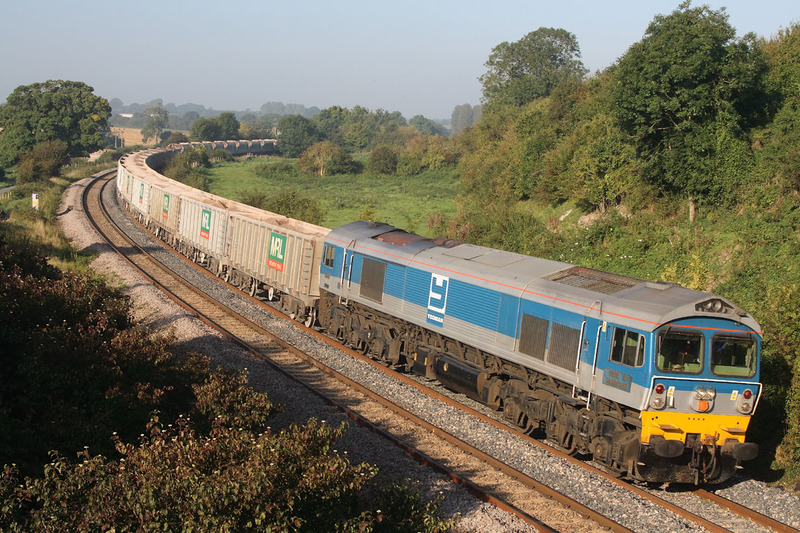 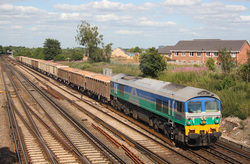 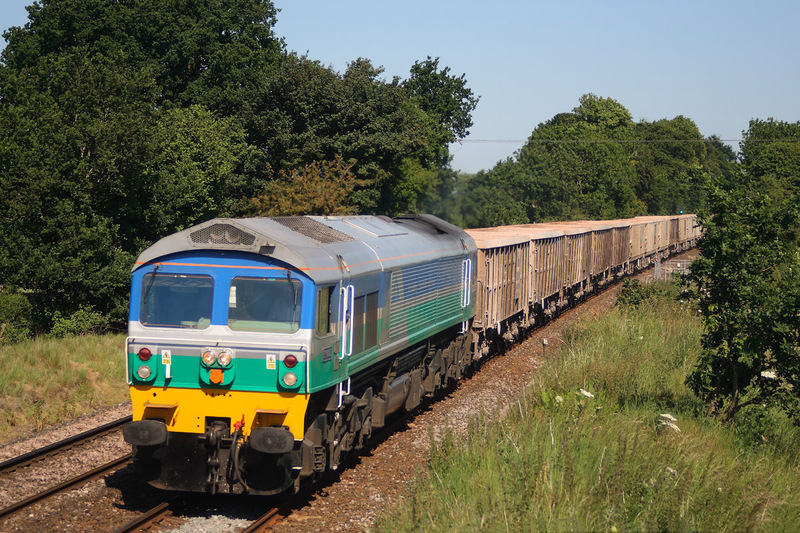 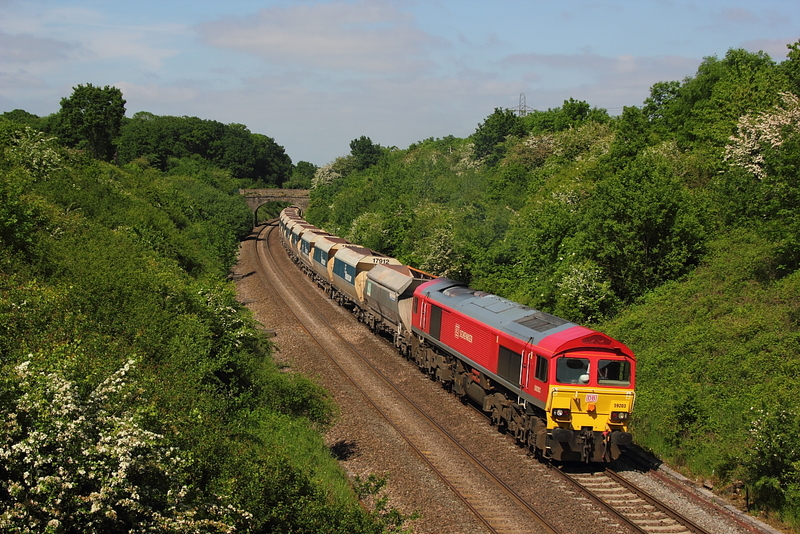 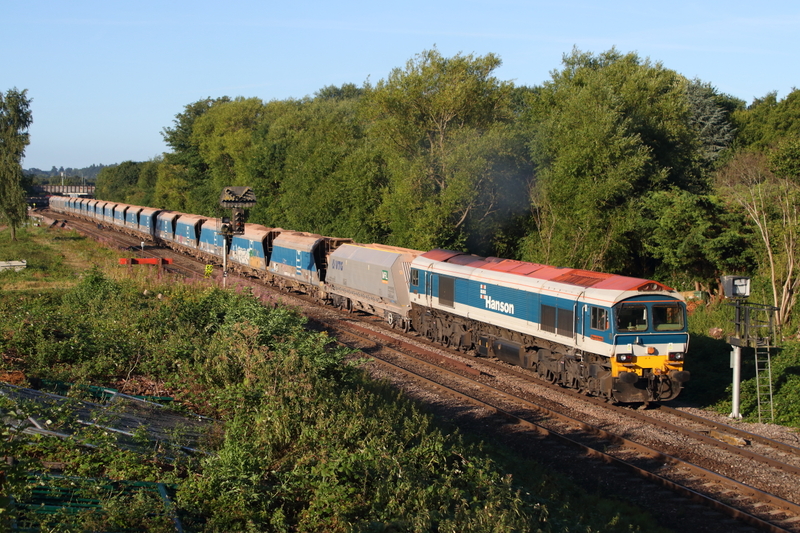 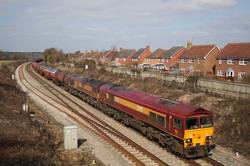 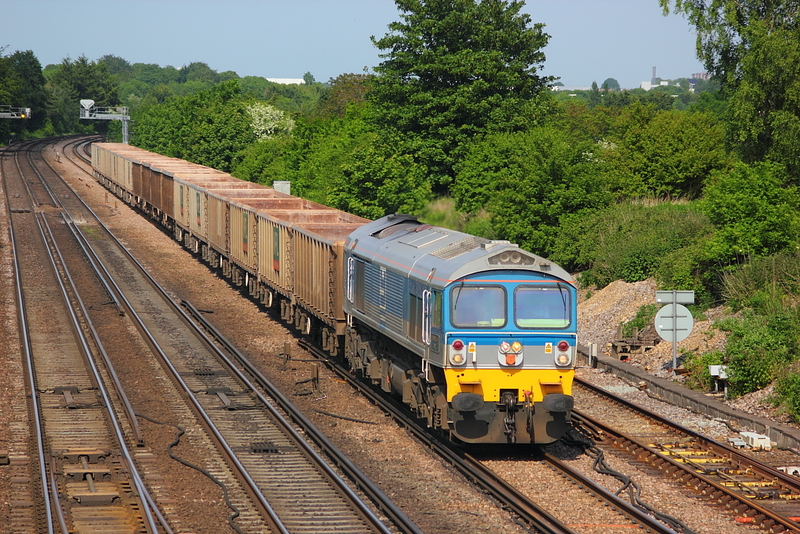 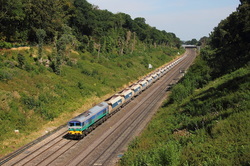 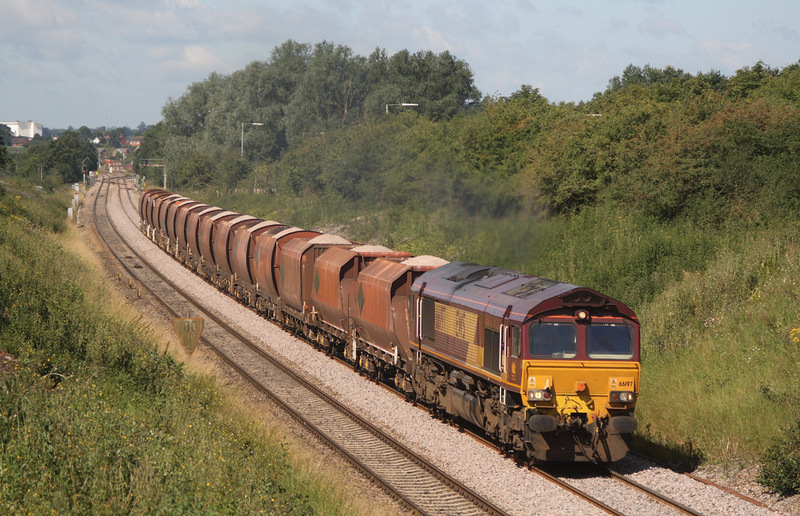 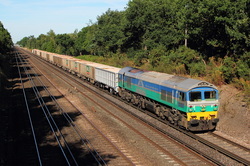 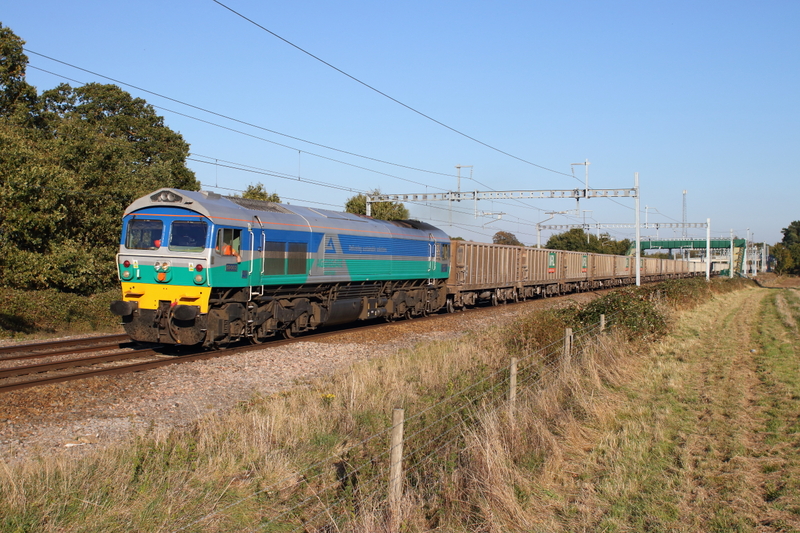 59103"Village of Mells"+66089 DIT..7A17 Merehead to Acton empties. 59202"Vale of White Horse"7A09 Merehead to Acton. 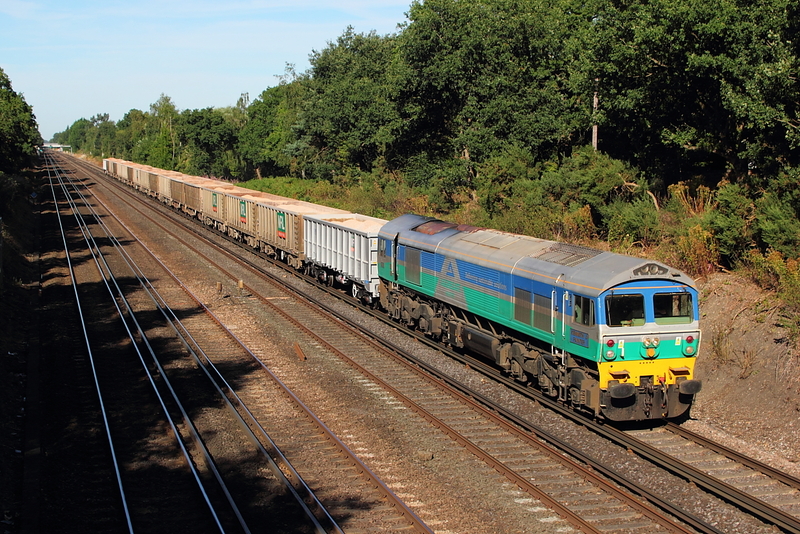 59104"Village of Great Elm" 6V18 Hither Green to Whatley empties. 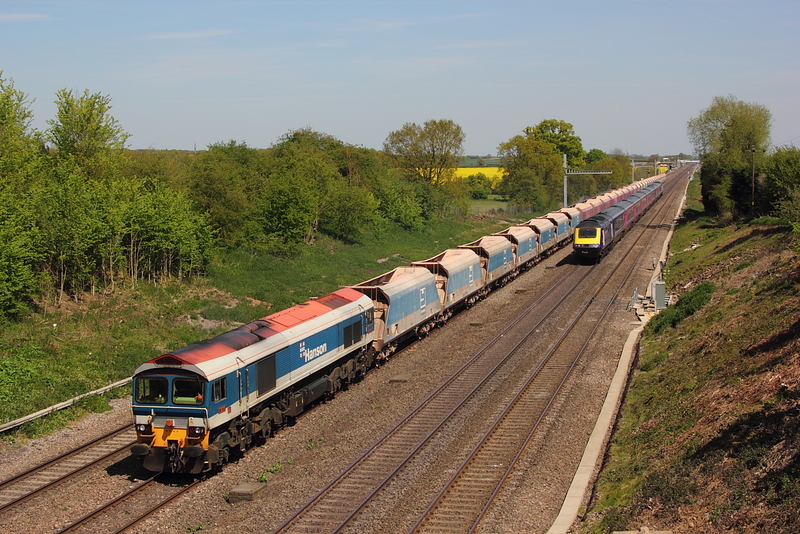 59002"Alan J Day" 7C77 Acton to Merehead empties. 59204"Vale of Glamorgan"6C74 Theale to Whatley empties. 59206 ..6Z34 Merehead to Bow loaded aggregate. 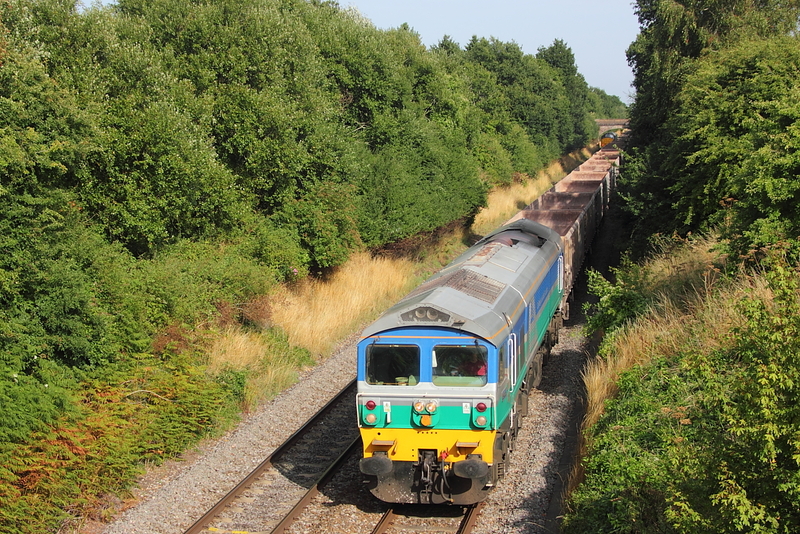 59204"Vale of Glamorgan"7A64 Whatley to Theale loaded stone. 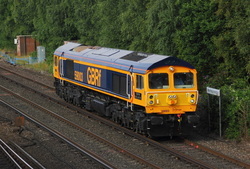 59005"Paul A Hammond"7A09 Merehead to Acton. 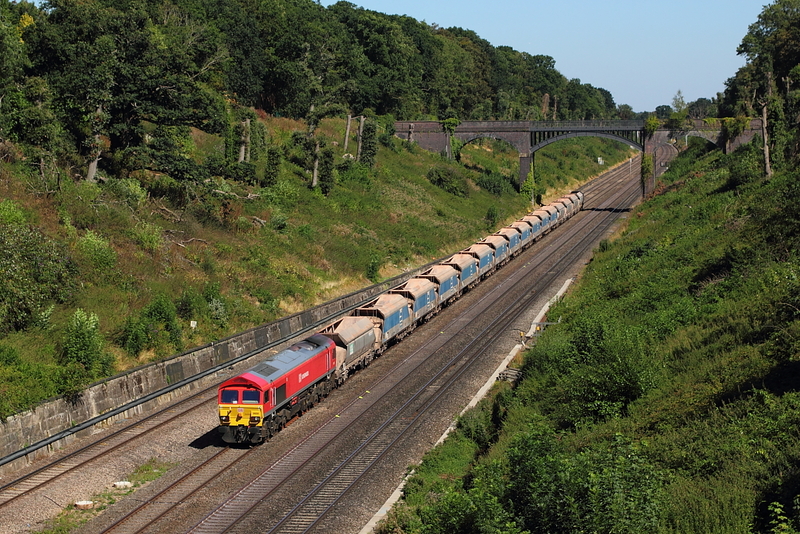 59002"Alan J Day" 7A09 Merehead to Acton loaded limestone. 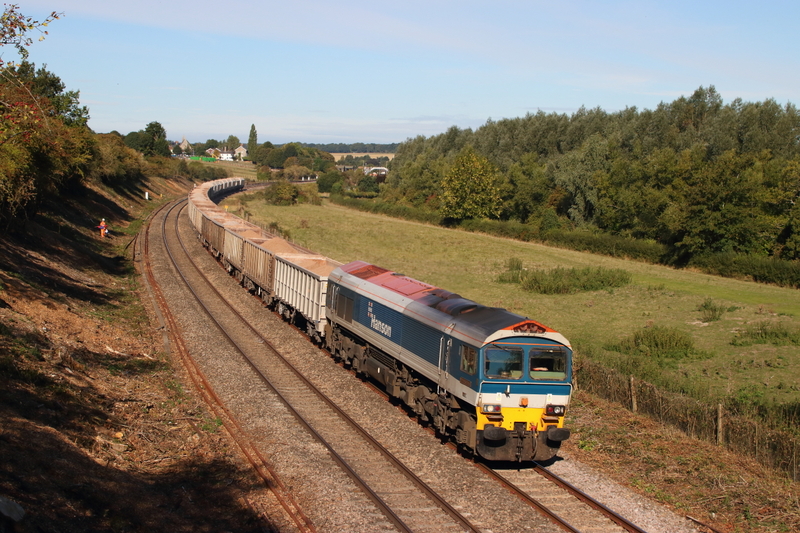 59005"Kenneth J Painter" 7C68 Wooton Bassett to Merehead empties. 59203"Vale of Pickering" 7O40 Mearhead to Eastleigh loaded stone. 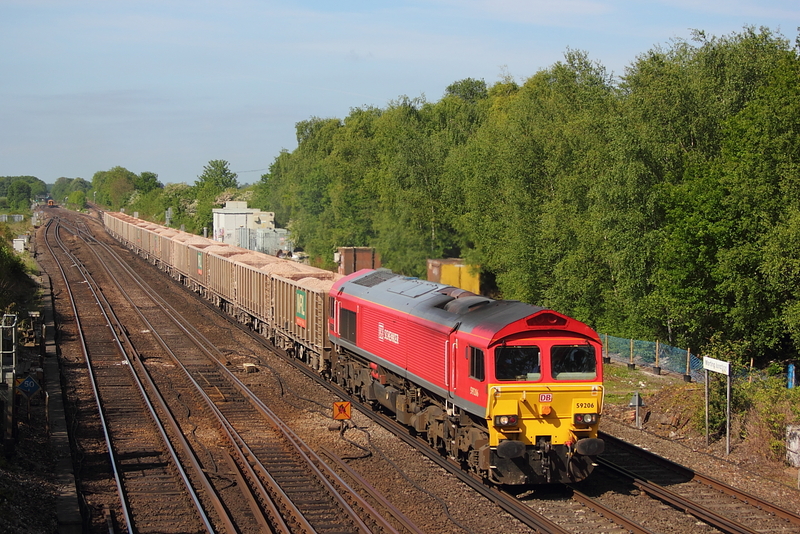 59205 7A17 Merehead to Acton loaded stone. 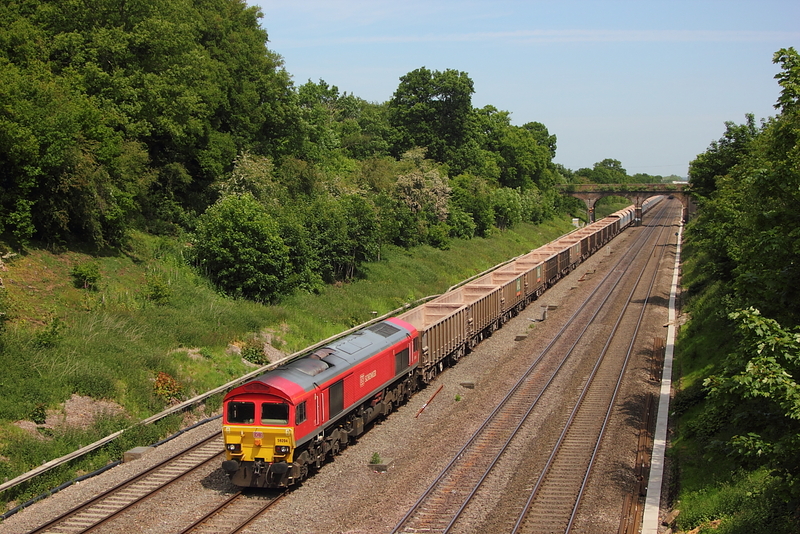 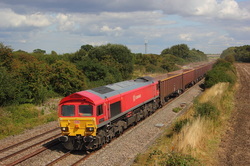 59201"Vale of York" 7O48 Whatley to Hamworthy loaded stone. 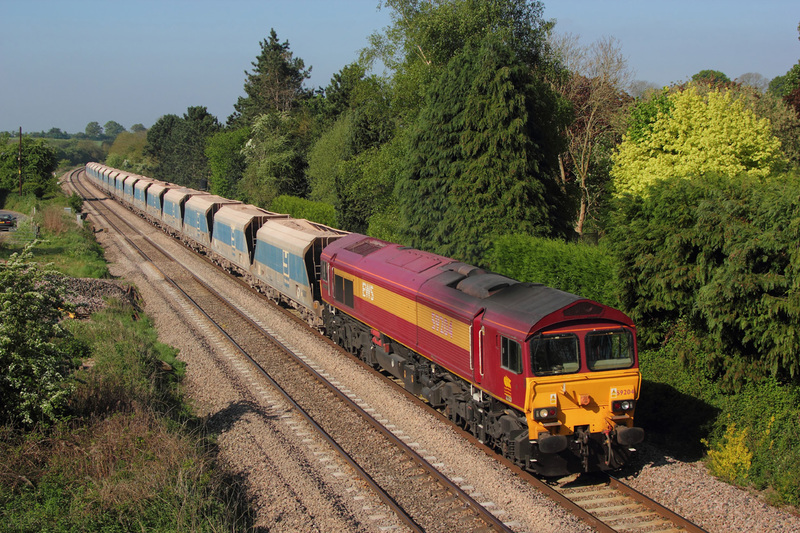 59102"Village of Chantry"+ 59103"Village of Mells" 7A09 Merehead to Acton loaded stone.